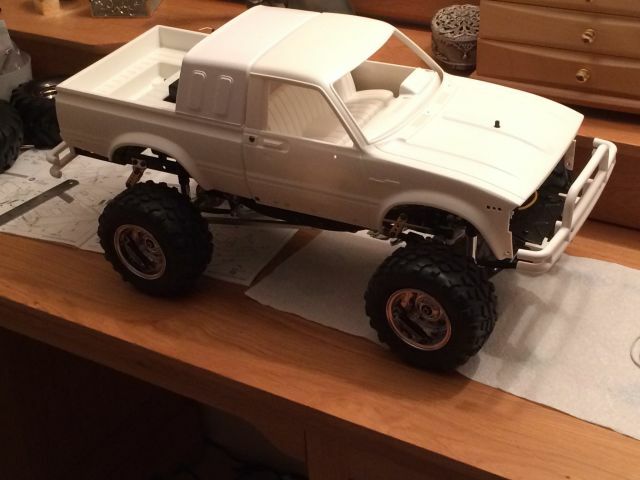 I have been building a Tamiya Bruiser Hilux over the last 6 months which I bought just before Xmas last year. 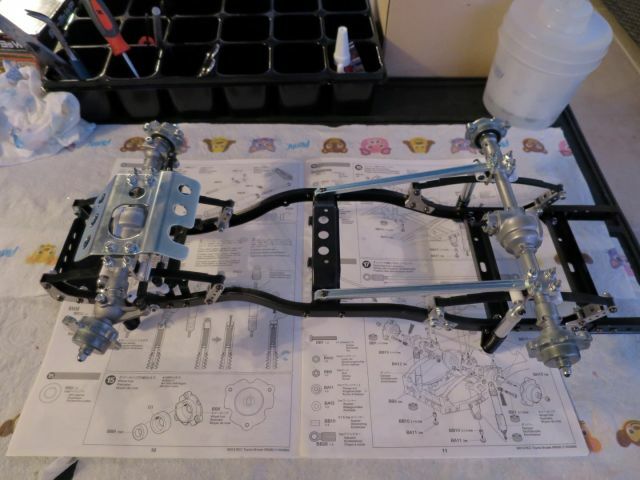 I didn't start the build until after xmas during the holiday period and managed to complete the chassis for the most part in those couple of weeks. I have documented the build in depth as I went (for another forum) since I couldn't access this one at the time but it seems a shame not to mirror it on here where it will no doubt be appreciated more. It is not yet complete so I will post up the steps which take me to where I am now. It has been an awesome build and hopefully it'll give those considering one a taste of what it is like to build one. I sat on the fence for a long time with this because it is a substantial outlay but what an epic build and model it is. My apologies in advance since this was written at the time and so it might seem a little strange in the use of the past tense but I'm carrying much of the diary over as I wrote it then, to capture the spirit/mindset at the time of build. 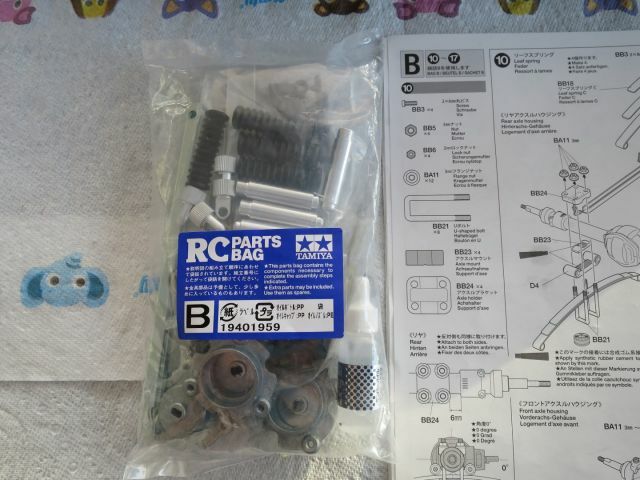 Parts bag A. Comes with threadlock paste and grease etc. 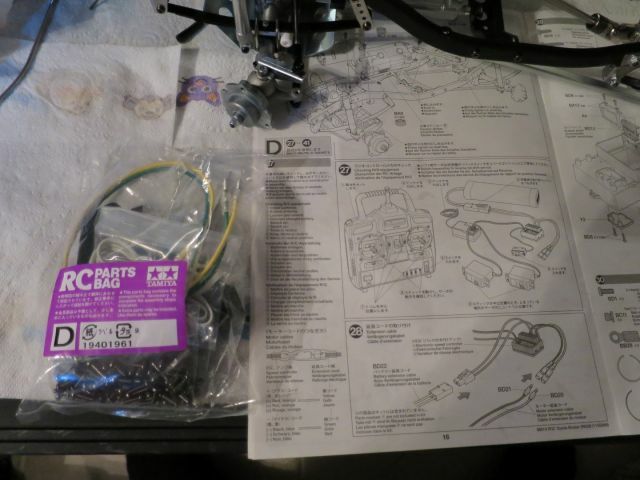 Thankfully, unlike other Tamiya kits where you are constantly reaching for other part bags each containing the necesary parts for particular steps, it appears that the bruiser kit is in proper part bag steps, so steps 1-9 appear to pertain purely to parts bag A which should keep things somewhat tidier. Ok, the first four steps. 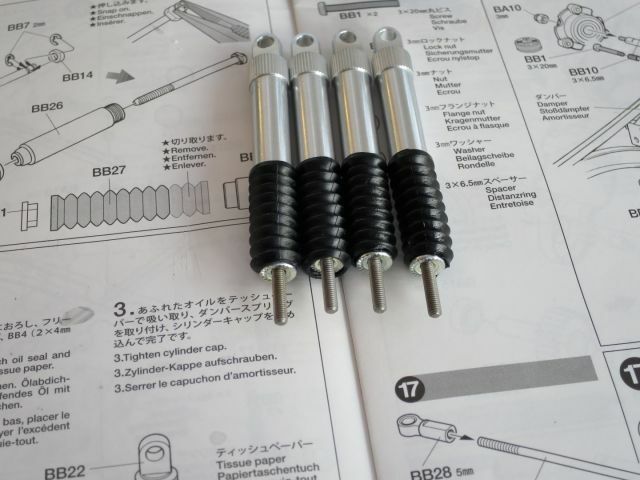 It took me 2h 30mins to do 4 steps! 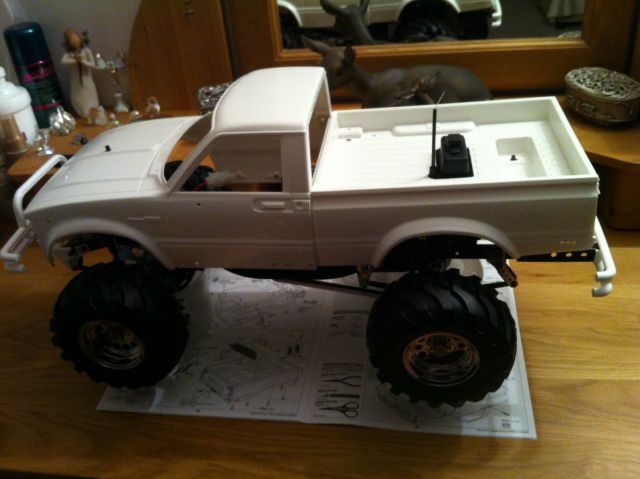 So, starting off, it's nothing like any previous Tamiya kit I've done. 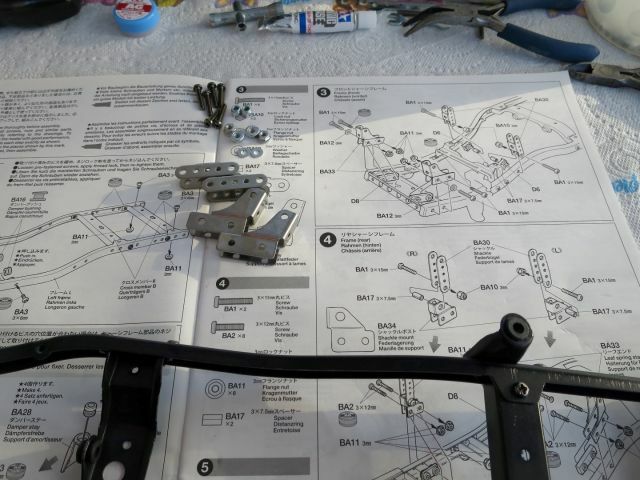 Can anyone say Meccano? 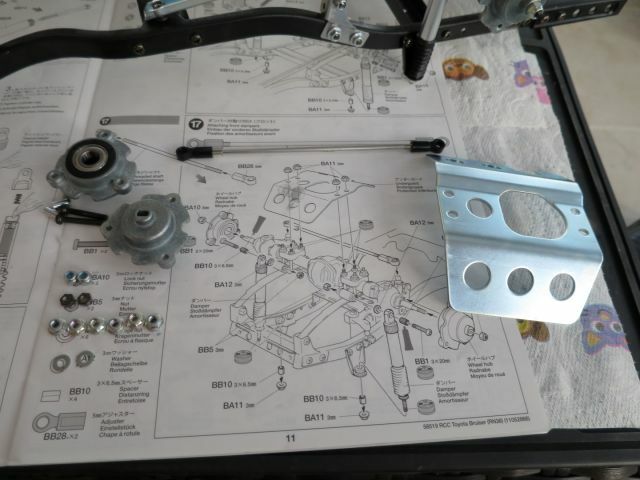 Step 1 seems easy enough, undo some of the bolts holding the chassis braces in place, threadlock them and fit a few extra screws, also threadlocked. So the kit comes with a threadlocking gel (anaerobic gel). It can be a bit messy so I'm dipping the thread with the tweezers! Here's step 1 done. 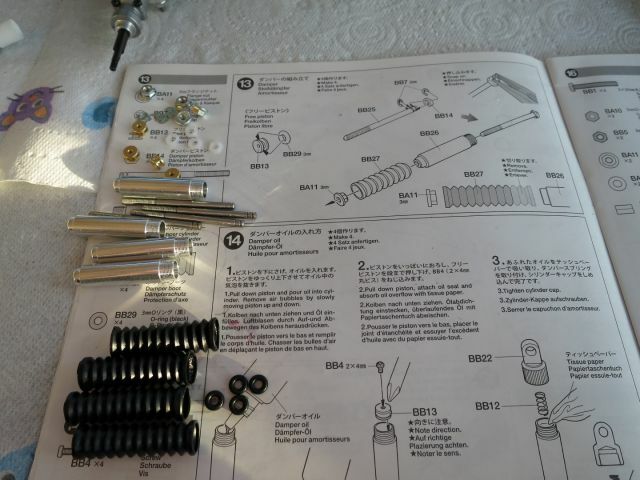 Quite a few screws required for step 2. Hurrah! 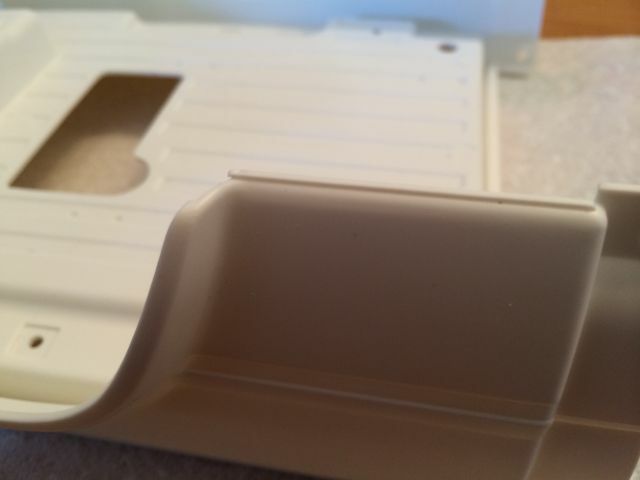 I'm reminded it's a Tamiya kit as I come across my first piece of plastic on the kit!! 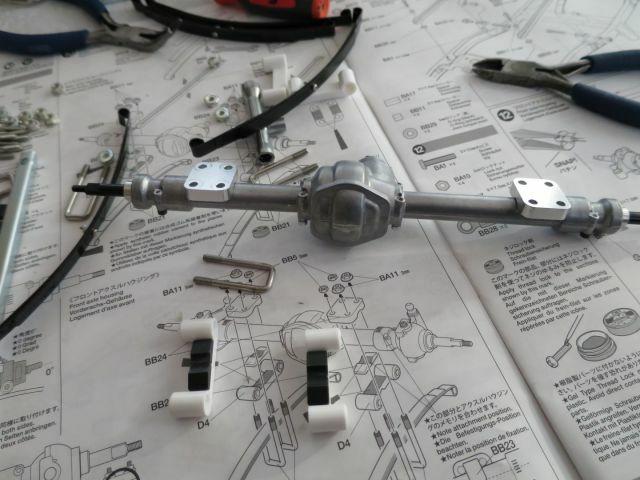 Next stage will be to build up the axles. I can't believe it has taken this long to do four steps but I'm taking it slow and taking pics as I go. 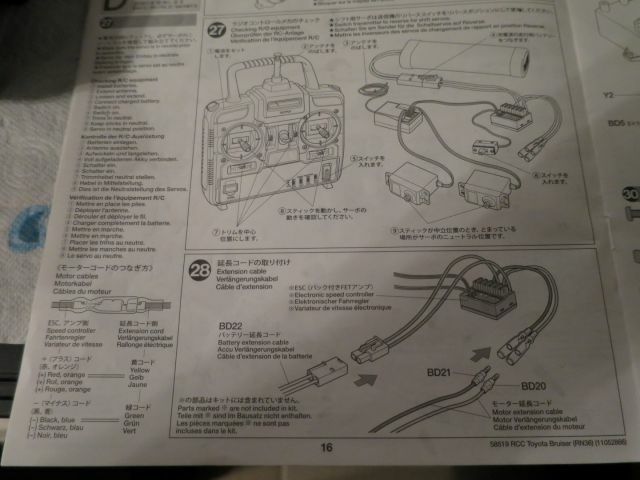 It's so easy to miss something and my eyes are going funny from scanning the instructions so closely. 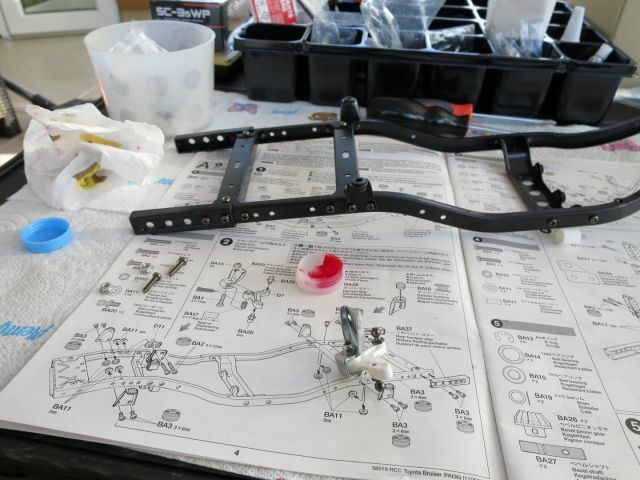 I missed out a metal spacer in one pair of leaf spring linkages, fortunately I spotted that it didn't seem to move as smoothly as I expected and on re-scanning the instructions realised where I had gone wrong! 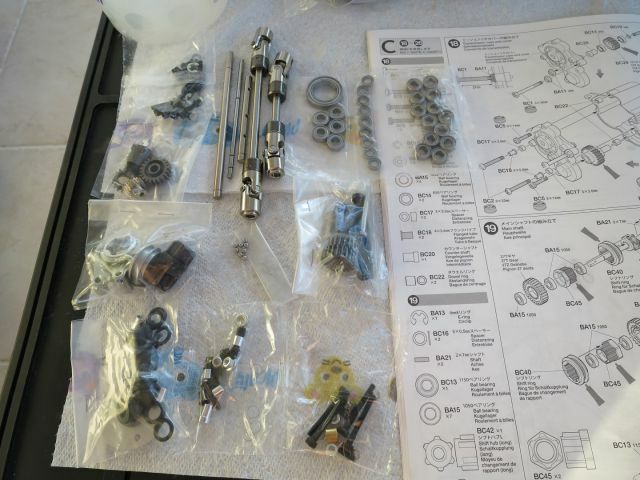 As you can see, for the moment it resembles a Meccano set more than a Tamiya kit! 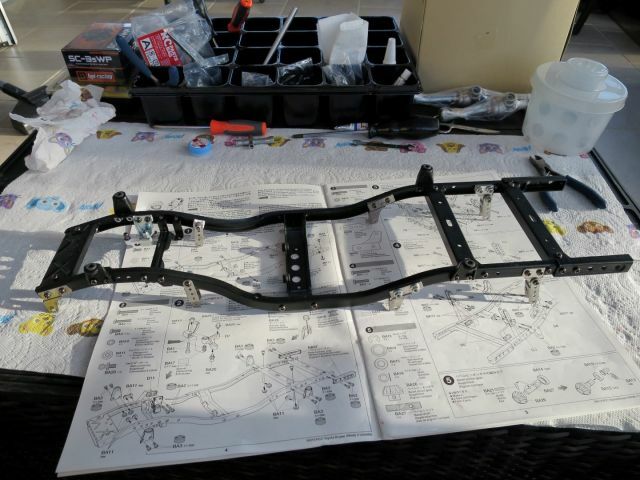 The chassis and all the mountings are incredibly solid now it is all tied, braced, screwed and threadlocked together. 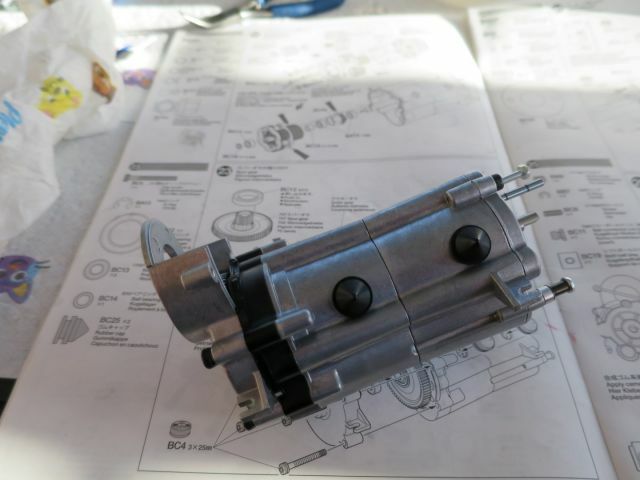 It's very true to life also in so far as the details go, such as rubber bushing to the strut tops and what I believe will be the gearbox mounting bushings on the chassis. All the different pressed metal pieces are very intricate and detailed and exceptionally well thought out and executed. 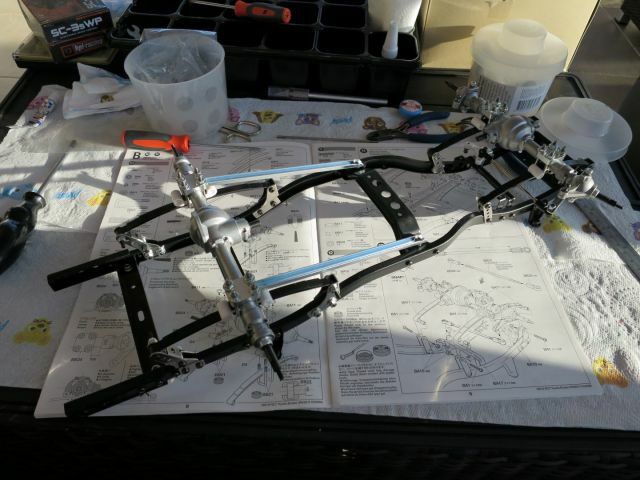 Although I'm staggered it has taken me this long to get this far, it's nice to see something taking shape and it beginning to resemble a proper ladder chassis. It pays to be well organised, I'm using the remnants of my kids lego calendar as divider pots for the different bags and a little pot to hold the open screw bags, although still keeping the parts in their individual bags but using the pot to make sure I don't lose any! 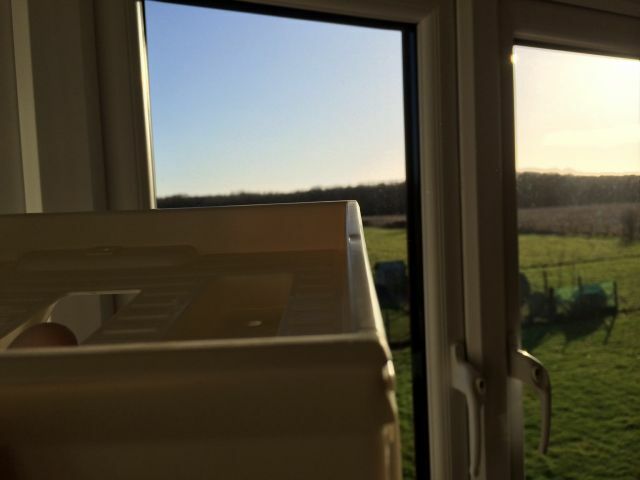 It also has a lid so if I do need to leave the build I can put a lid on it so to speak. It's really not the kind of build you want to undertake with kids about or if you need to keep leaving it. I'm trying to build it over a few hits, a bit each day 2-3 hours. 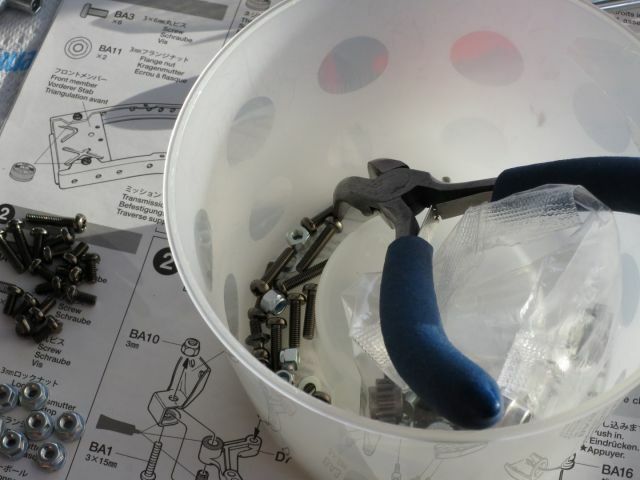 There are so many pieces, losing one would be a real ball ache! 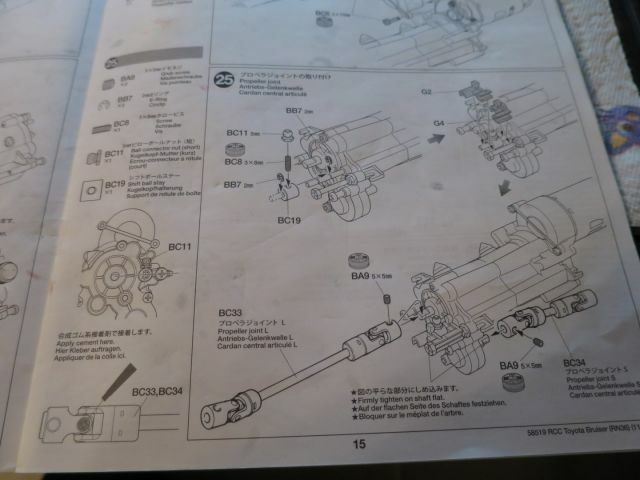 Next phase will be axles. Oh yeah, vintage models are great with all the labeled part bags. I just got my first "modern" kit today, a Dark Impact, and opened it up to find a bunch of random bags. 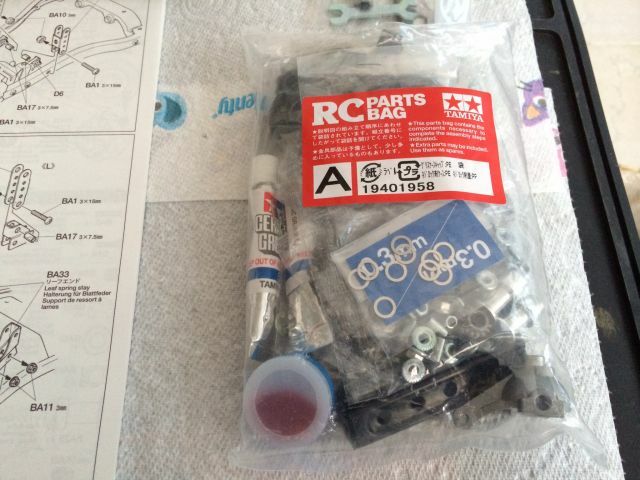 I had no idea that most kits don't have labeled parts bags. I look forward to this one. 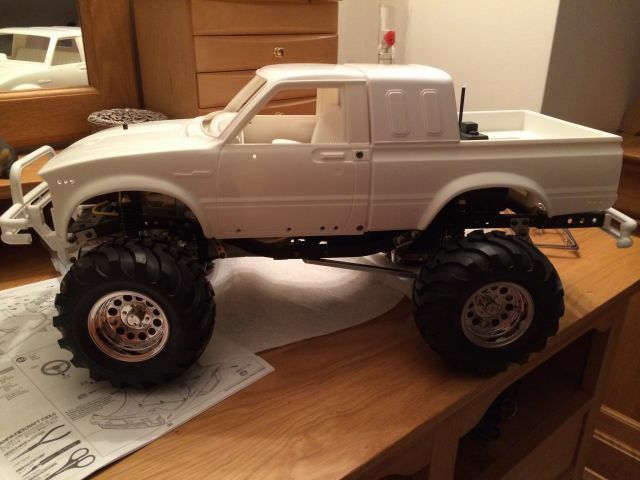 Like above, this (and any 3-speed to be honest) are what I consider to be the ultimate Tamiya Rc. But my funds and fiancée are obstructing my chances of getting one anytime soon, so I shall just have to watch in awe. With discipline and careful thinning out of my collection I'm sure I could get one into my fleet. Me like 3 speeds. .. ... . .. ... watching I am ! About another 2 hours gets me to step 9, or the end of bag A!! Wow wow wow and wow. For me this has been the best part of the build so far. 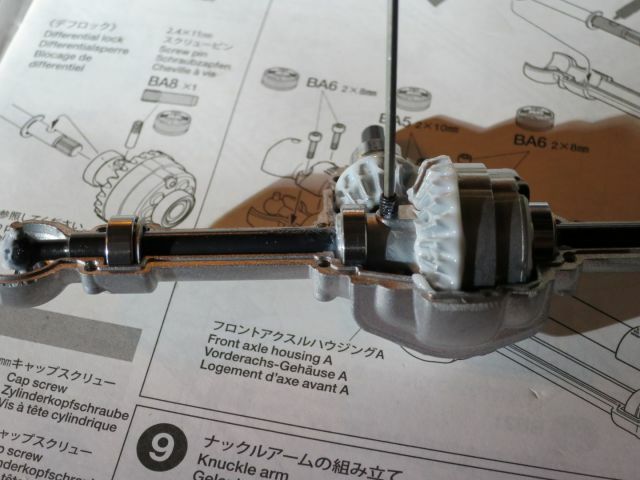 I really really enjoyed this step, which was building up the front and rear axles. 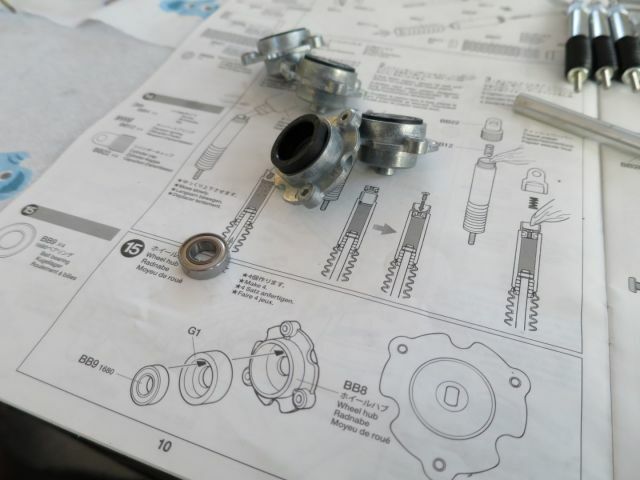 The quality of the components and the way it goes together is quite simply awesome. 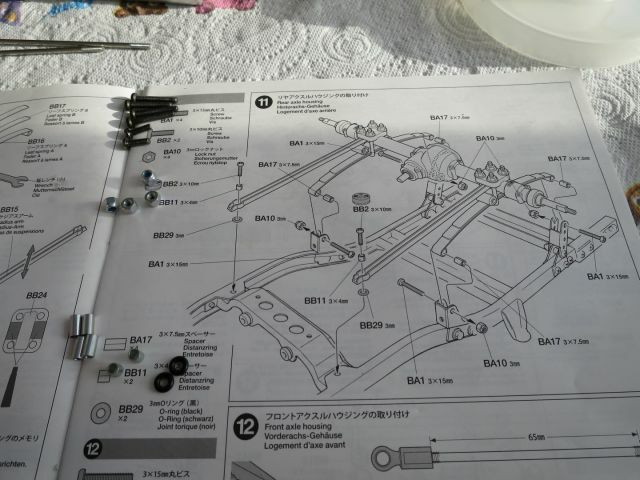 This is much more like it, not that the first part wasn't good, but the quality of the Tamiya screws lets the ladder chassis part of the build down a little. 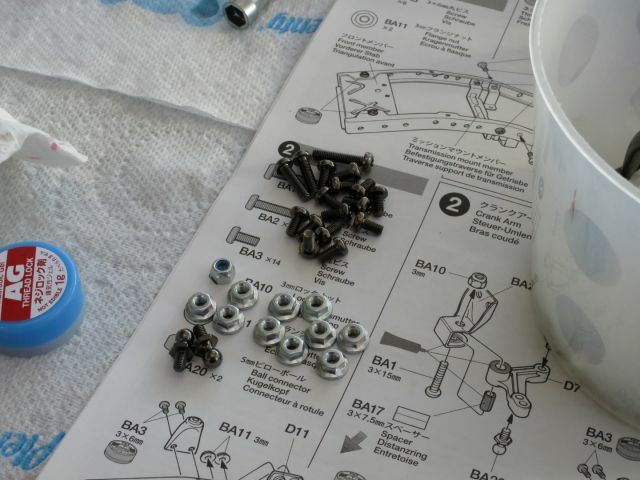 It's probably a good idea to get an uprated stainless hex bolt kit before commencing the first 4 steps! Pleasingly the same can definately not be said of steps 5-9. I have never seen such high quality bearings, they are super smooth, highly polished and simply ooze quality. 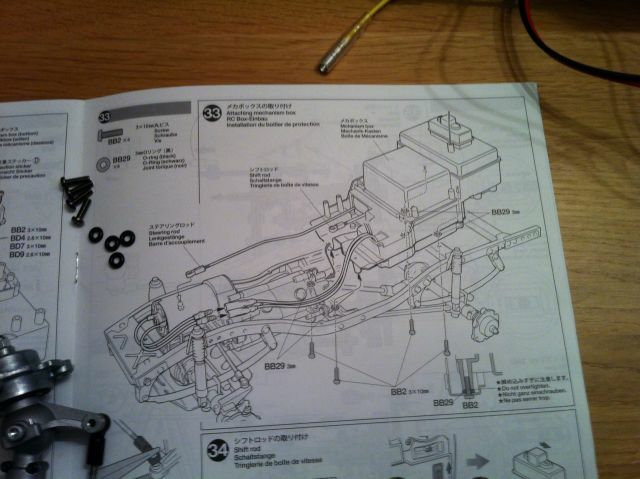 So, step 5, it's dark and I'm building this in the conservatory using a torch to illuminate the work area! 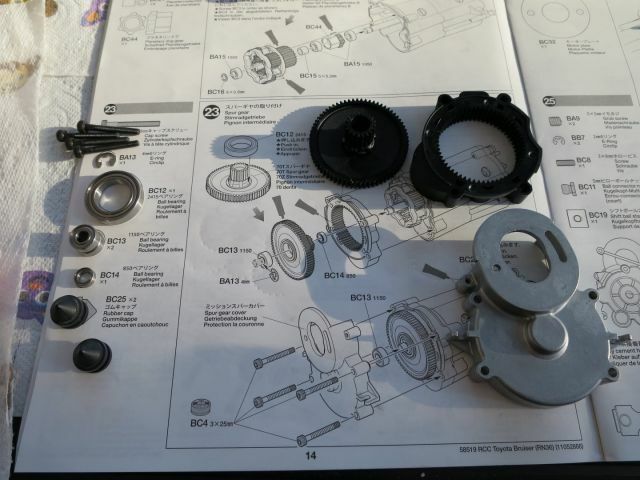 These are the pinions and shafts which exit both the front and rear differentials. 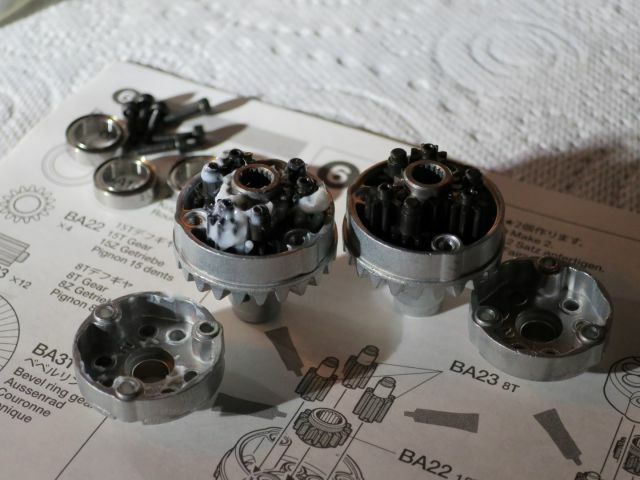 You can't really see the quality of the bearings or the gears from the photo, but trust me they are fantastic. Both fully assembled. 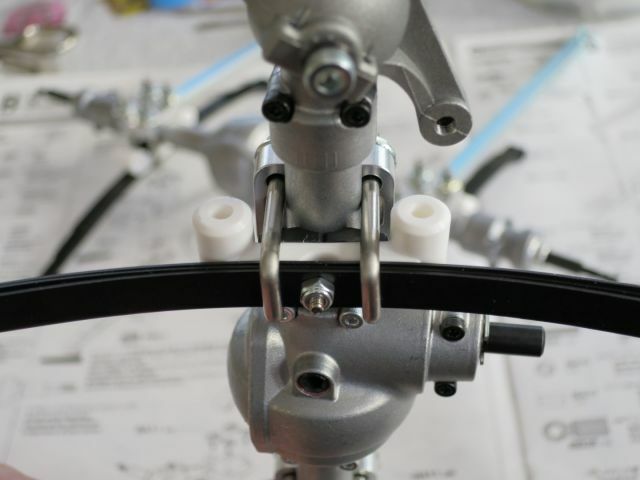 The diffs are all bolted together and once again the quality and fit is second to none. No plastic here at all. 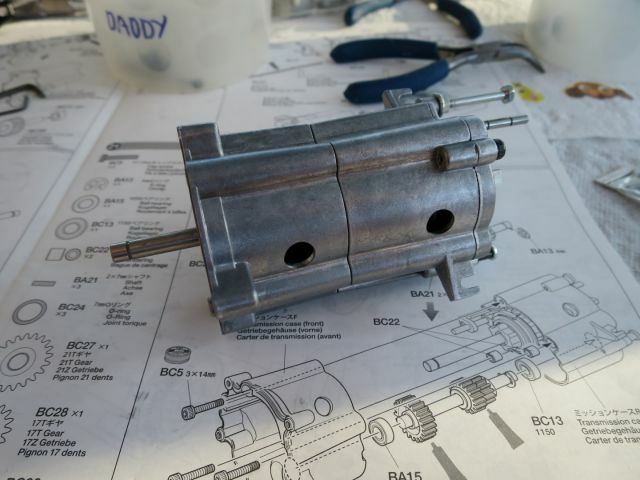 Step 7 and the rear diff is ready to go into the rear axle which will be built up in this step. All greased up and ready to close up. Once again, everything slips into place beautifully. 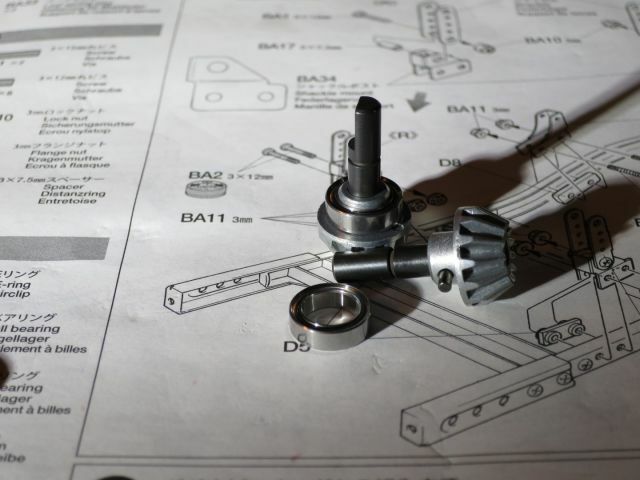 The smoothness of the differential and bearings is sublime and highly rewarding for your efforts. 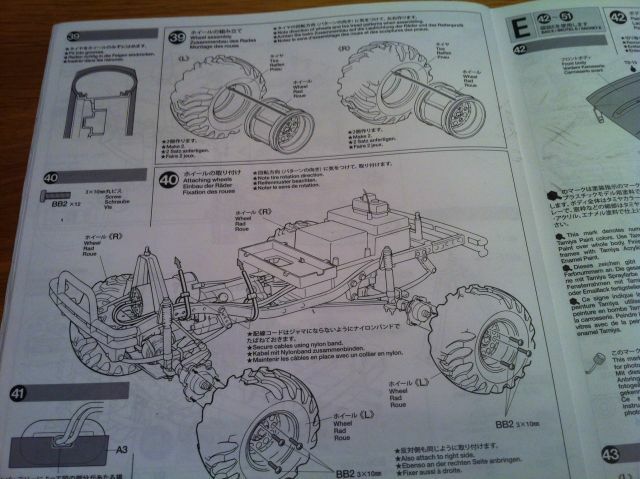 Step 8 takes us to the front axle. 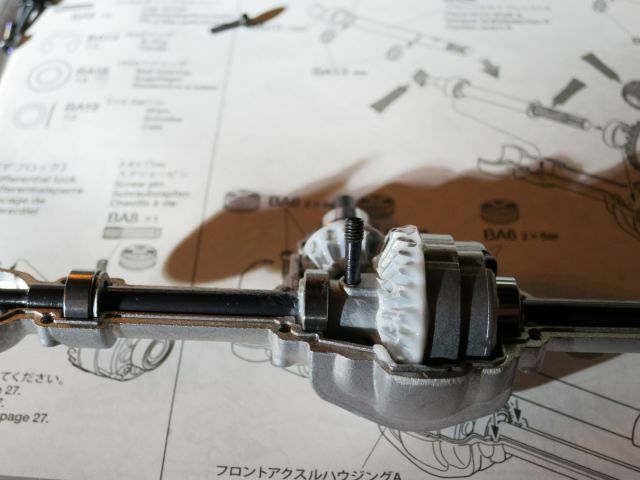 It's the same process virtually as the rear axle. This time around I've photo'd the locking diff option. 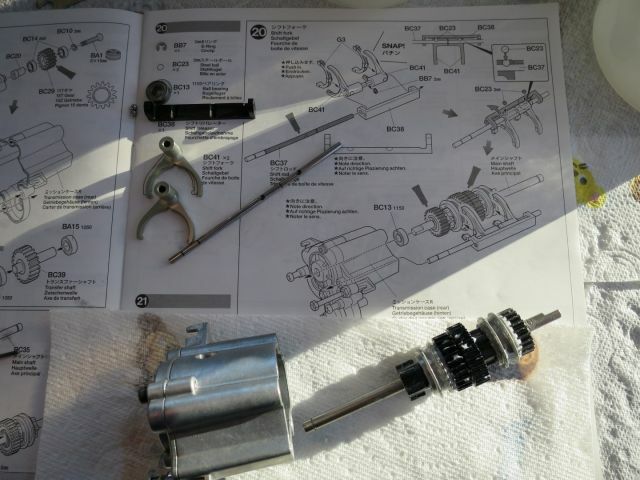 I've left both of mine open, however if you want to lock them, you simply insert this extended grub screw through the diff housing and through the drive shaft which has a hole in it, this locks the shaft to the differential crown gear so the shaft cannot turn independently of the diff. It's a real neat detail. 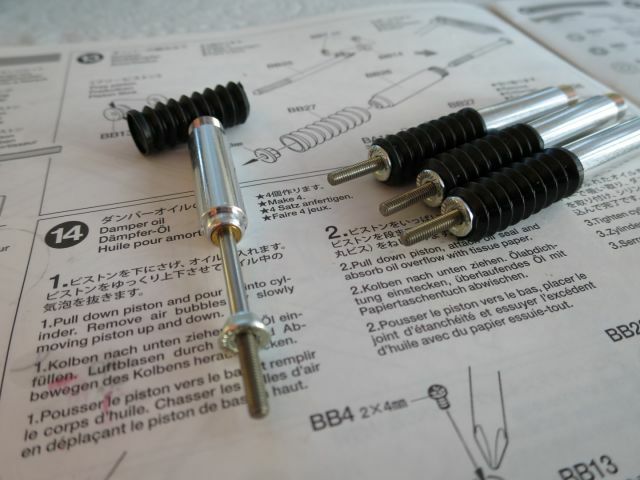 Anyway, I left mine open so that extended grub screw was removed which allows the shaft to move independently. 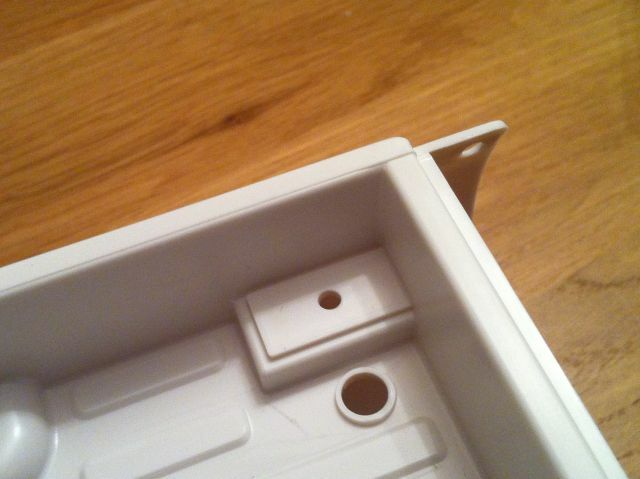 The outer diff housing has a short grub screw which covers up this access point in the housing. 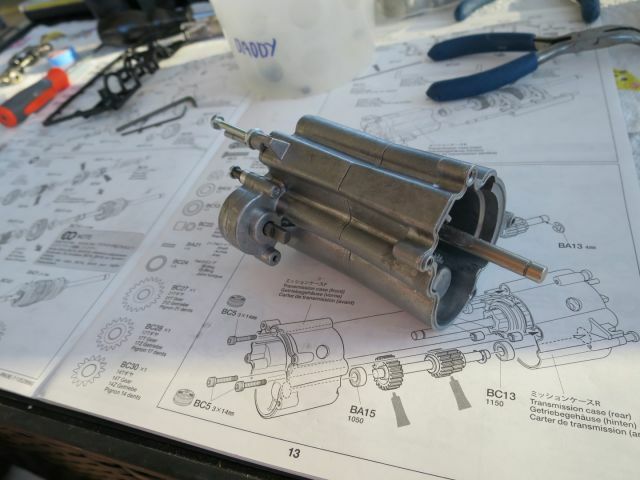 So to lock the diff, remove the outer grub screw which can be seen in photo below, insert the extended grub to lock the shaft to the crown wheel, then reinsert the short grub to seal the housing. 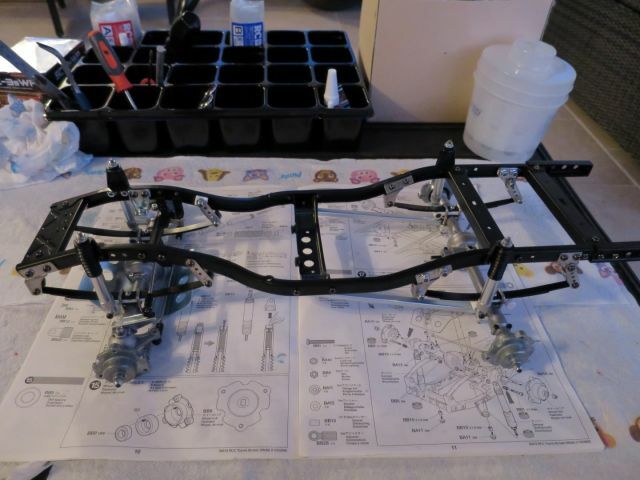 The photo below shows the front axle completed including step 9, which is to add the steering knuckles to the axle. Apologies if this build diary is a bit carried away. So far this build is everything I was expecting it to be, I'm delighted with what I've seen so far. 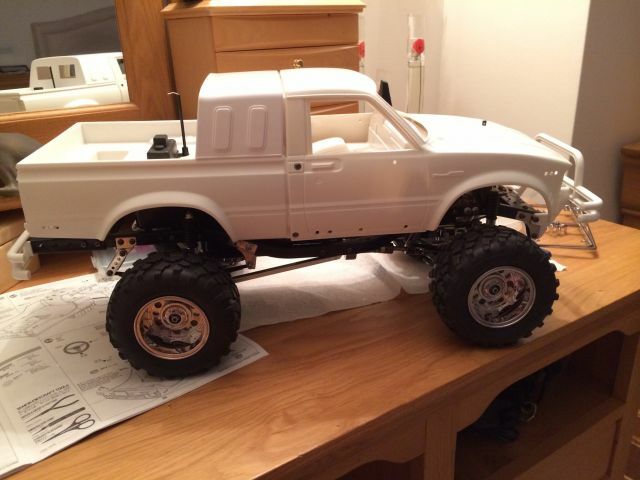 The fact that Tamiya were producing this 30 years ago, (albeit I understand certain elements have been improved) is testament to how far ahead they were then and demonstrates why even vintage ones have stood the test of time so well. These were so expensive back in the day that for me they were unobtanium. The prices these can be had for now makes these far more accessible than they ever have been. The quality, engineering and detail has made this a very satisfying build so far. Suspension tomorrow!! 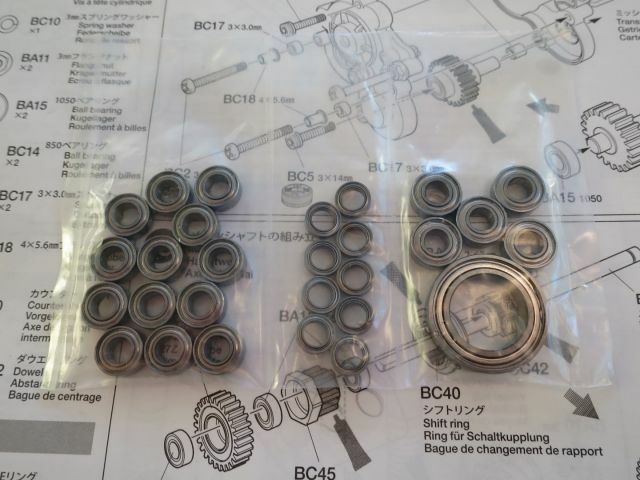 I'm hoping I have enough threadlock and grease to complete the build. I've been quite generous so far, although I do have some medium strength loctite in case I do run out! Love it...please continue with this level of detail, I really wanna see how these go together. So I made a start on Bag B! This covers steps 10-17. 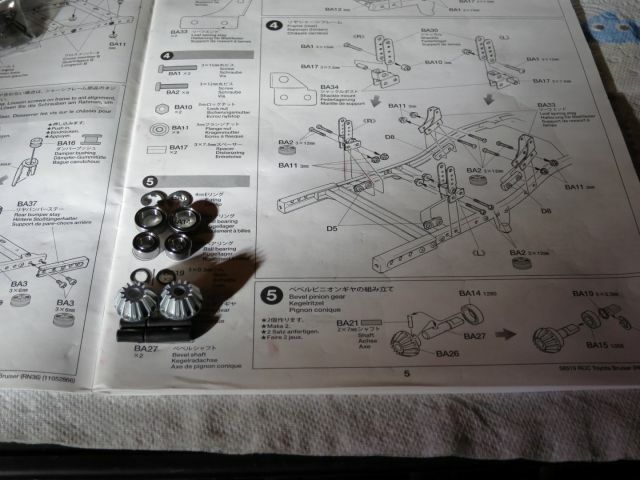 So, step 10 is to build up the leaf springs and shackles and mount them onto the axles. All sounds easy enough. 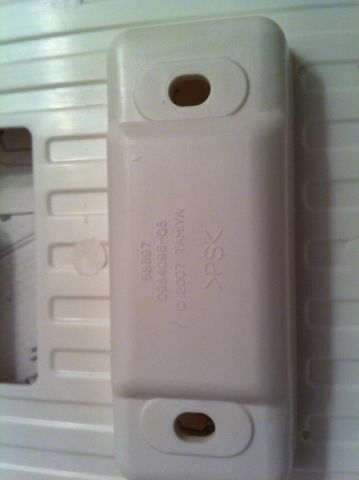 Here's a close up of the parts, once again lovely quality. But then first snag of the day. 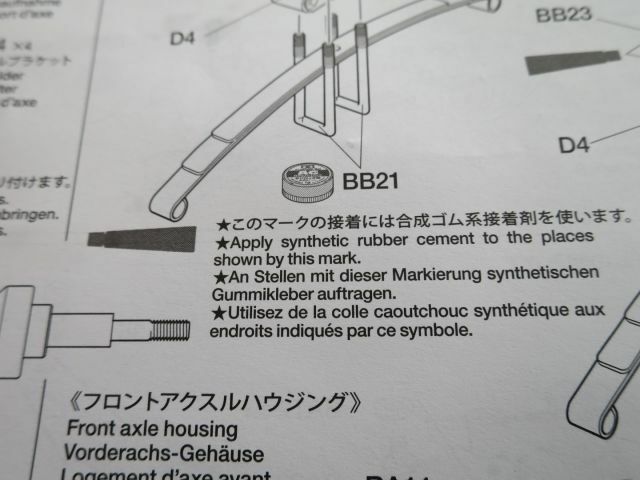 "Synthetic rubber cement", I've never even heard of it. 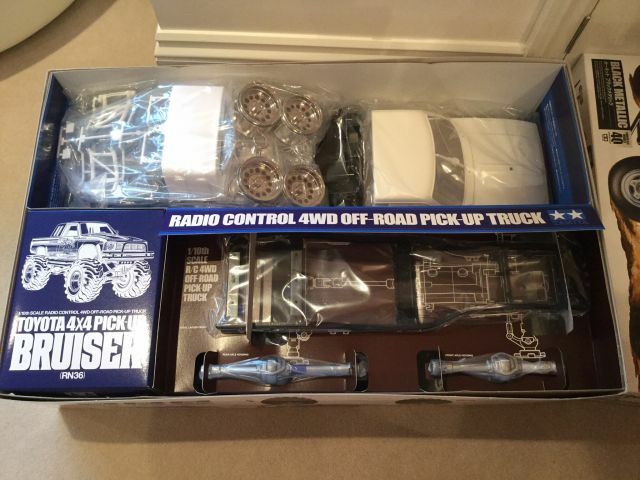 It's a poor show that the manual calls for it yet it doesn't come with the kit. I was really quite disappointed about this. 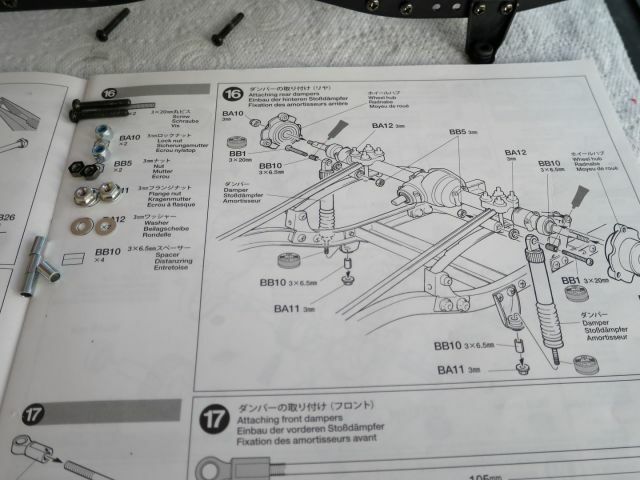 Anyway, moving on because I wasn't going to delay the whole build until I tracked this stuff down and also it looked to me like the only purpose it really serves is to hold all the components together while you bolt it all up as you'd need about 10 hands without. I used my hot glue gun, a very thin spread on the items noted. 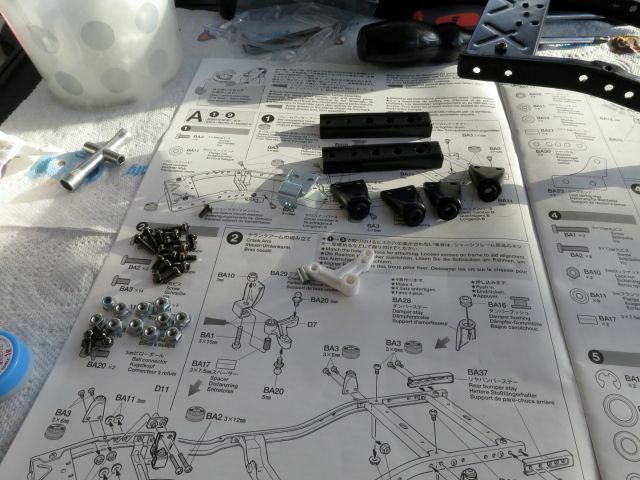 Below you can see the items that required this cement, namely the black metal inserts on the white plastic and the silver blocks on the axles. With four bolts tightening up the U shackles I didn't think the cement would actually hold these items in place once installed, surely the clamping force would be sufficient. If not I'll need to re address it later but I'm sure it'll be fine. 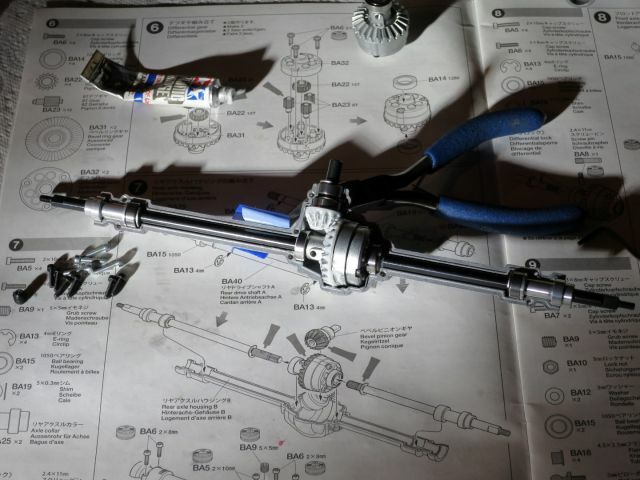 On the front axles I only used the hot glue on a couple of parts and juggled the rest. There are various requirements to set up here, angle of shackle against the axle, distance from the hub etc. The picture above shows the silver blocks in the wrong place, they actually needed moving in a bit! My wife had gone shopping with her mum at this point so I was left at home with the kids. In typical fashion it was right at this point that my youngest decided to start behaving like a monkey. He's 8 years old and came in disrupting everything. Anyway, long story short, eventually I managed to get it all where it needed to be. I didn't enjoy this step at all, in fact it was the worst so far, not helped by the circumstances! Sounds like my earlier warning of not building this with kids in the vicinity came back to haunt me! 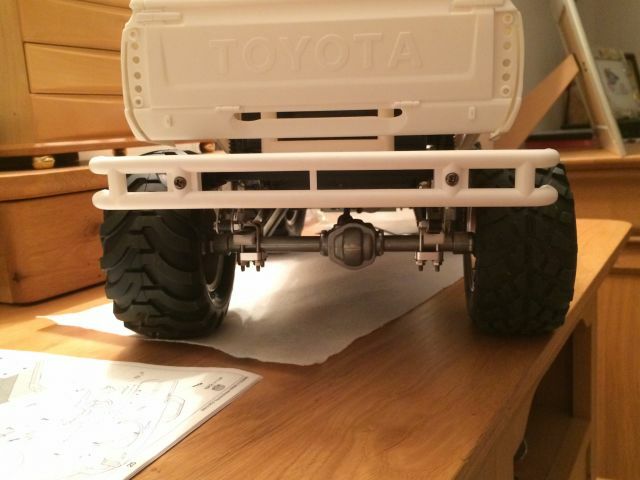 Axles built up below. This step with all the distractions and thinking about what to use in lieu of the cement stuff took me 2 hours and 20 minutes!! There were a couple of minor errors I made here that I later had to rectify thanks to various distractions. 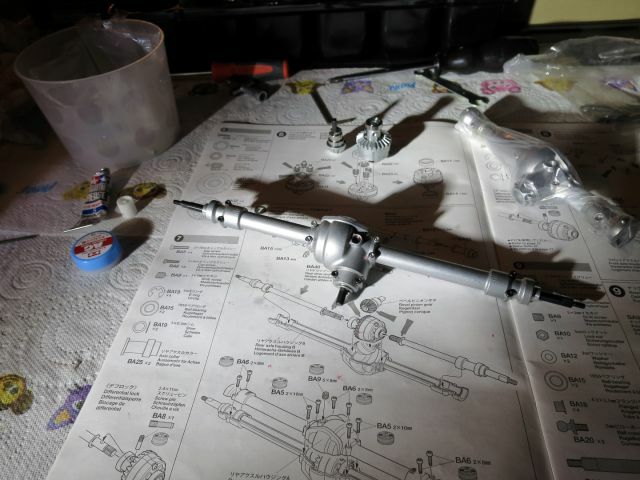 Anyway, with that all over, step 11 is where the kit starts to come to life. 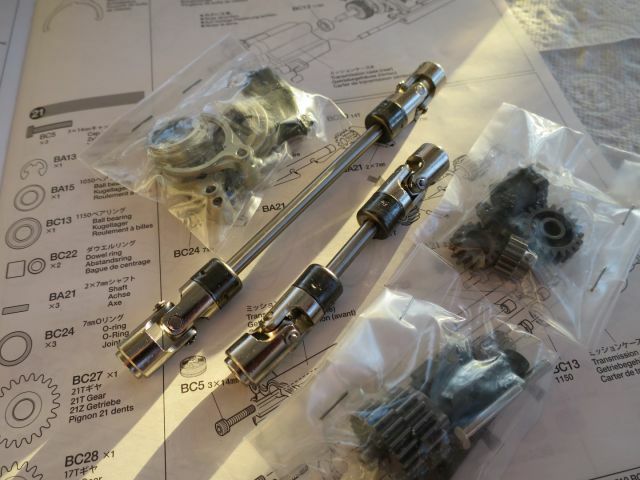 Bolting these up to the chassis. 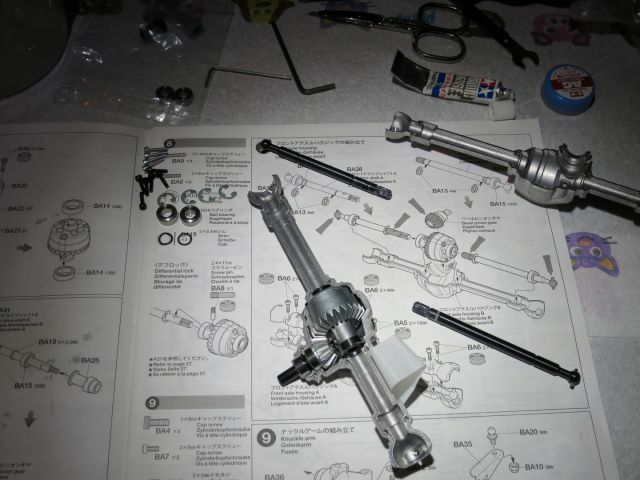 Step 11 is the rear axle first. 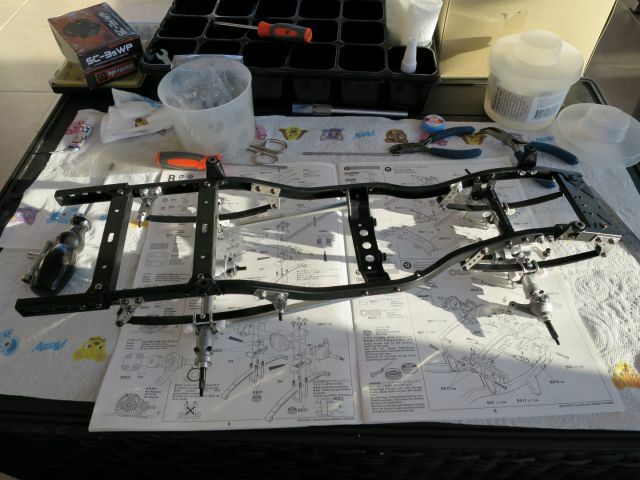 Step 12 adds the front axle to the chassis. 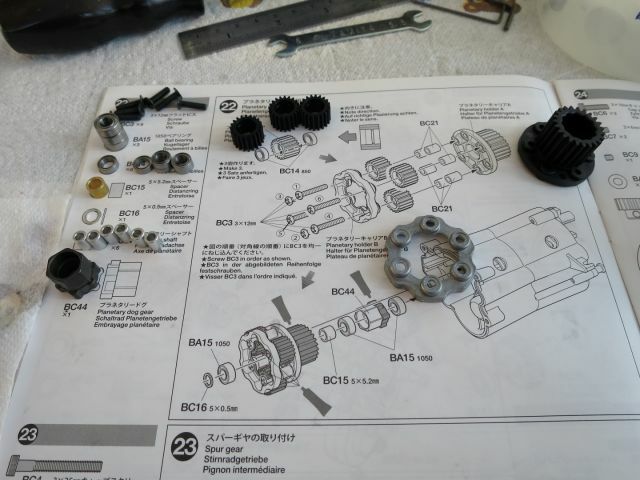 As with all the chassis build elements, the only let down are the screws Tamiya use made of cheese. 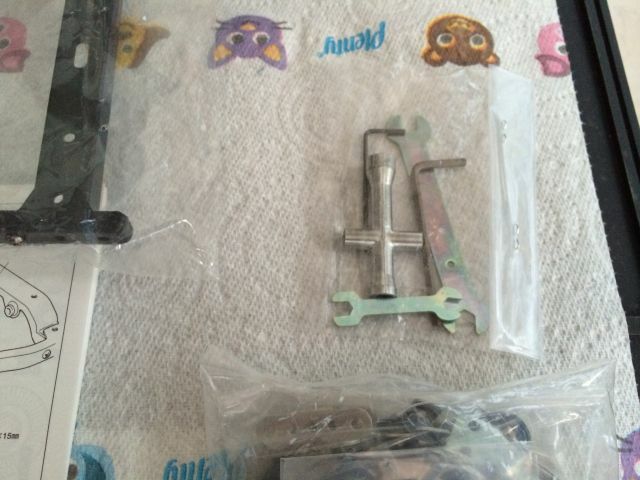 Not a problem really on plastic kits but on metal they are being tightened up more than on plastic. 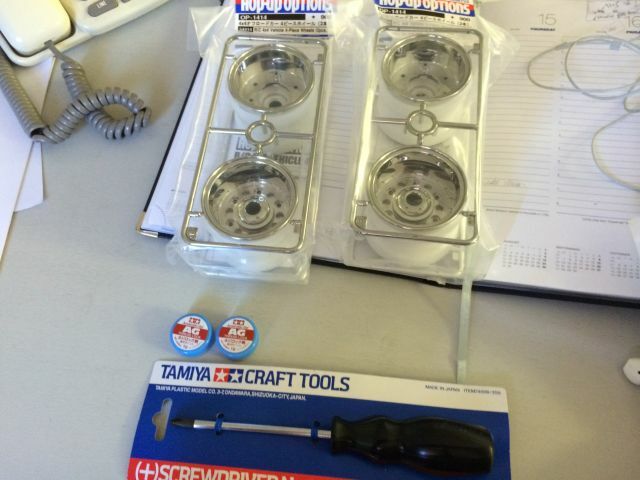 These ought to really be hex's made out of stainless. It would have made this part more satisfying. 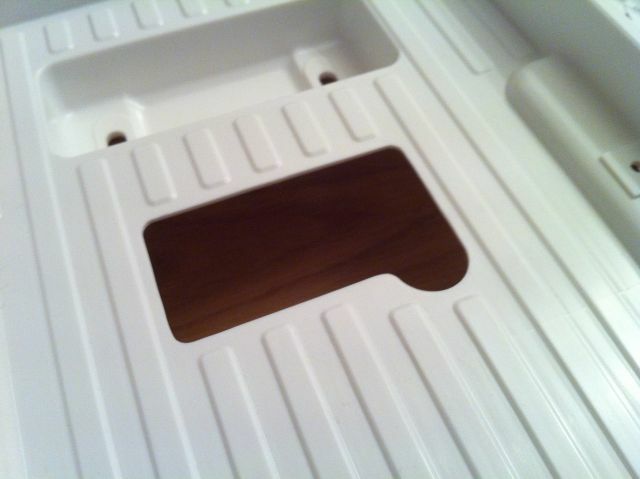 and here's a shot of the underside of step 12. I love the old school engineering and quality of components used in these; On the bruiser you get 4! Interesting to note that the chassis has the pickup points on it to add an additional 4 if you so wanted (actually make that three because the steering arm on the front right would get in the way of an additional turret unless the servo was relocated - something others have done!). 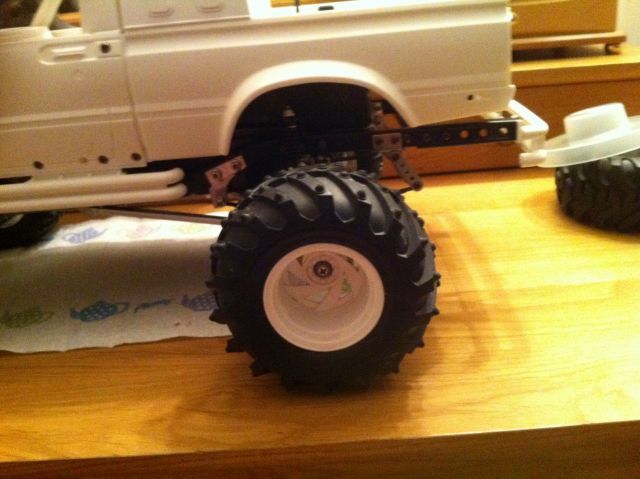 Of course then it would also lose scale realism so mine is staying as Tamiya intended. and step 14 all complete, dampers filled with oil, burped and sealed up. 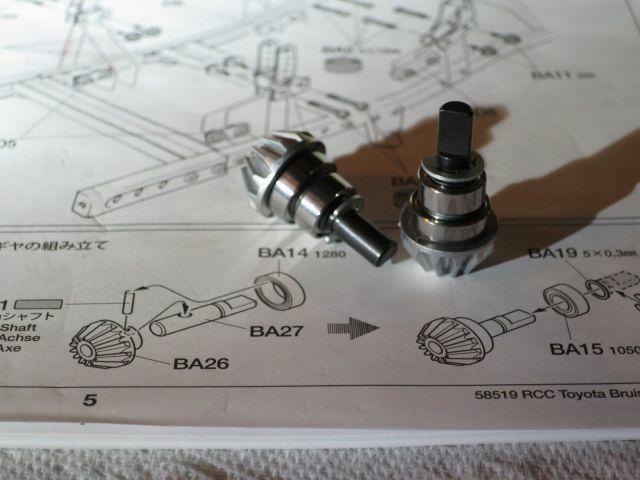 Step 15 is assembling the wheel hubs; Some more nice bearings and some bits of black plastic that gave me a hole in my hand after pushing down 4Nr against the tiled floor to get them seated in the hubs! 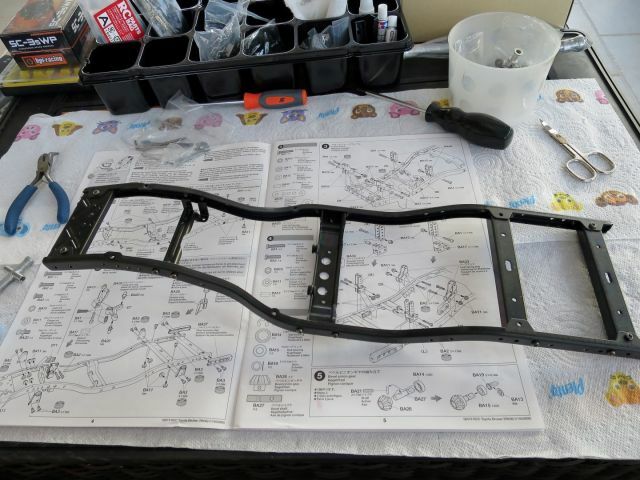 Finally step 17, which is the same to the front along with adding the steering arms and bash guard. 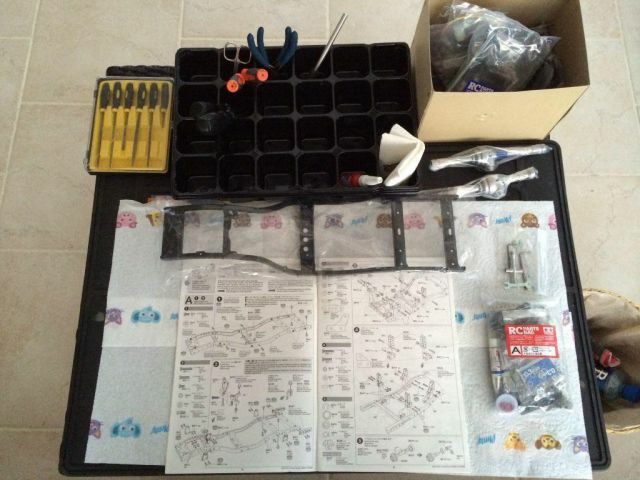 Components shown below. Just under 2 hours for the later steps, so in total today I spent about 4 hours and 15 minutes building. That's a cumulative 8 hours and 45 minutes from start to this stage so far. Of course one could go quicker and I'm busy taking my time and documenting it all. I think I'll probably be taking a break tomorrow and spending some time with the family. Between this and the Hornet I've had about 3 days out! 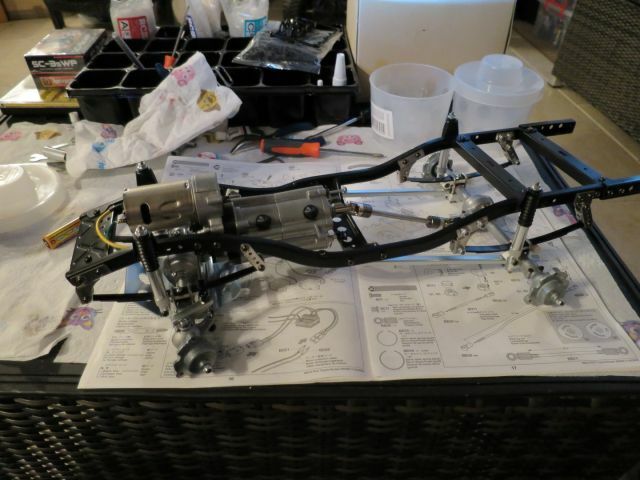 It's nice to sit back now and look at the chassis as it currently stands with fully working suspension. It's tempting to whack the wheels on just for fun! 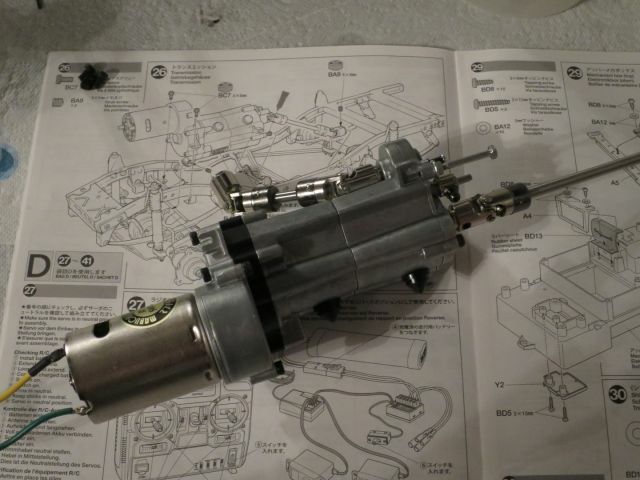 The next step is the gearbox. I definitely don't want any interruptions there so I'll need to find a convenient slot. I'm estimating at my current snail pace probably 2-3 hours for that. 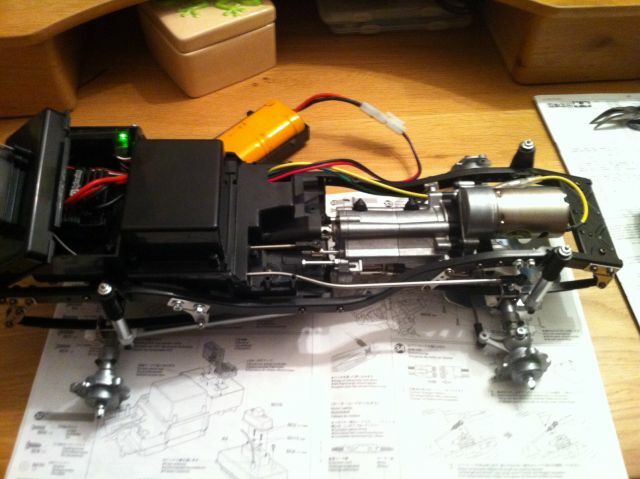 The radio gear, esc and motor follow on from there then bodyshell but it'll almost be a pity to see light at the end of the tunnel. I made a couple of silly minor mistakes today, all now corrected but it does annoy me when I find I've made a mistake! One of the steering knuckles has a slight tight spot at full lock so I'll need to investigate that more in due course. It's only slight but I want this build to be as perfect as I can get it. Others have had the same with their kits so seems it might not be a one off. All said and done, there are an awful lot of components that go into making this kit, very clever people who dreamt it all up initially. 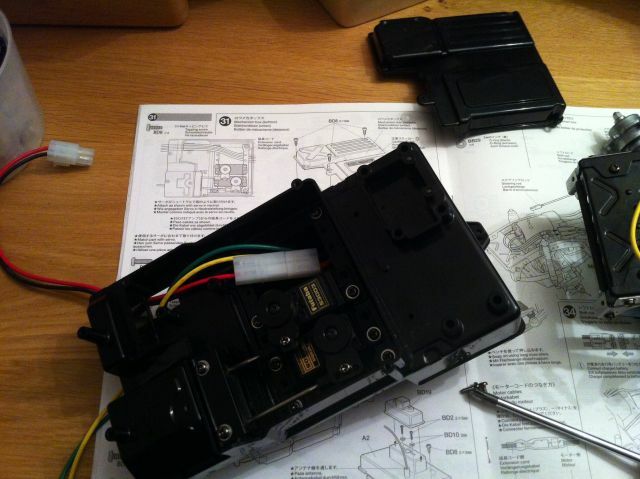 That's before even starting on the 3 speed box which is probably one of the more complex parts of the kit. I'm actually looking forward to that, hopefully it'll be as satisfying as the diffs! 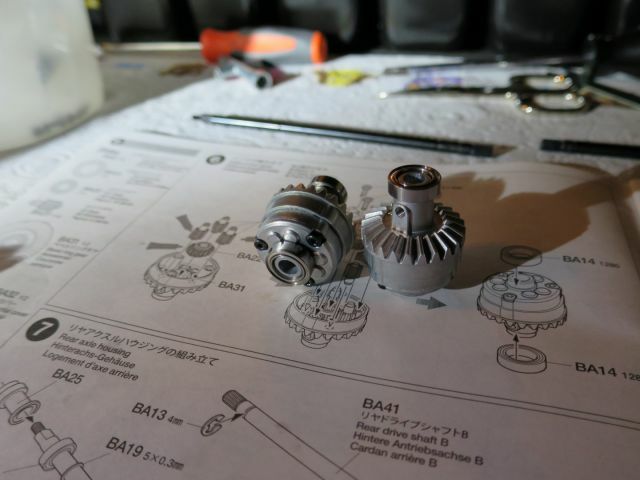 I'm loving the detailed build pics. This is still like "unobtanium" for me, so this really is cool to see it all go together. Thank you very much for sharing it all. Are you by any chance a Quantity Surveyor? Not quite but close! Is it that obvious? Ps. Is your Father John by any chance? 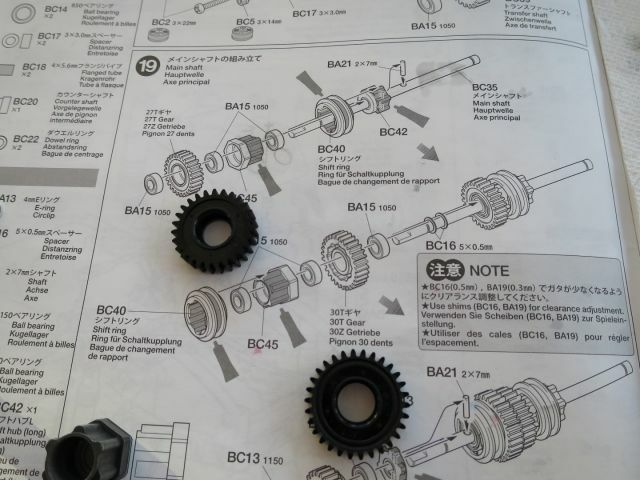 deep breath, Bag C steps 18-26 - The gearbox. 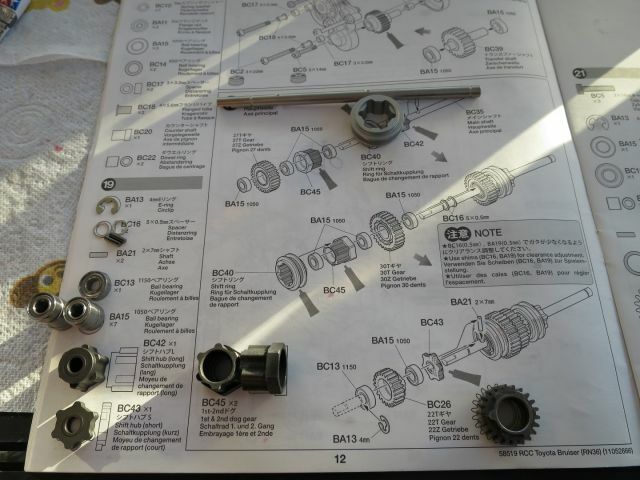 So to the gearbox. 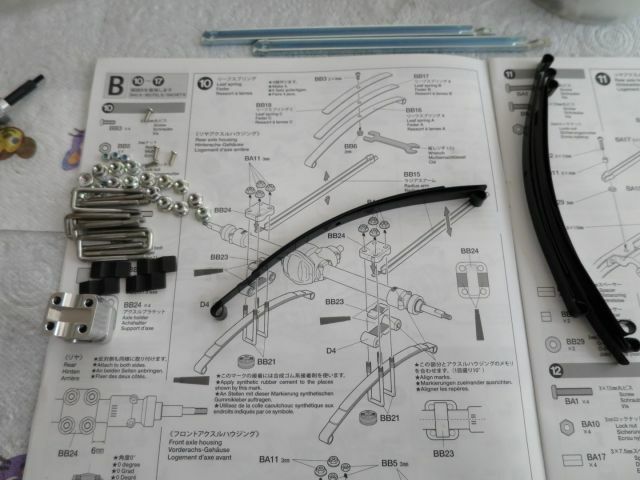 Step 18! ...coz Grease is the way we are feeeeling!!! Insert...you can see the gearbox outlet for the front axle here. This engages with first gear, interesting to note that all cogs/gears to do with the front wheel drive part are full metal. 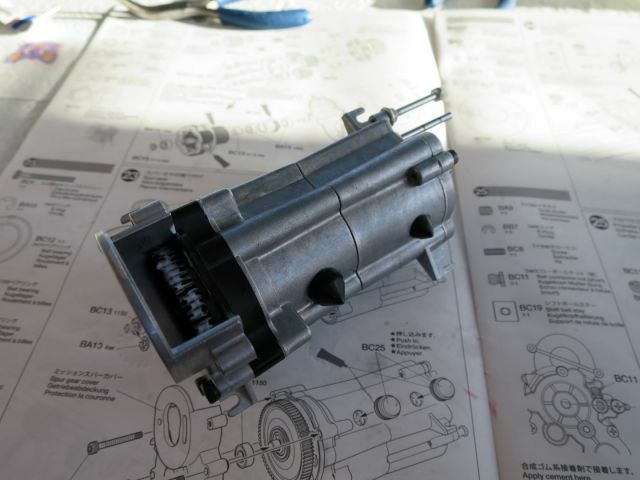 again I didn't get a pic of this little assembly, this really was covered in grease...but here it is added to the gearbox...was debating whether to have the rubber plugs fully pushed in as on the right which gives a really tight seal and looks hard like an 80's stud lol! Or as on the left. Think it's supposed to be like the one on the left so I corrected it. I have seen some kits built like the stud look though. 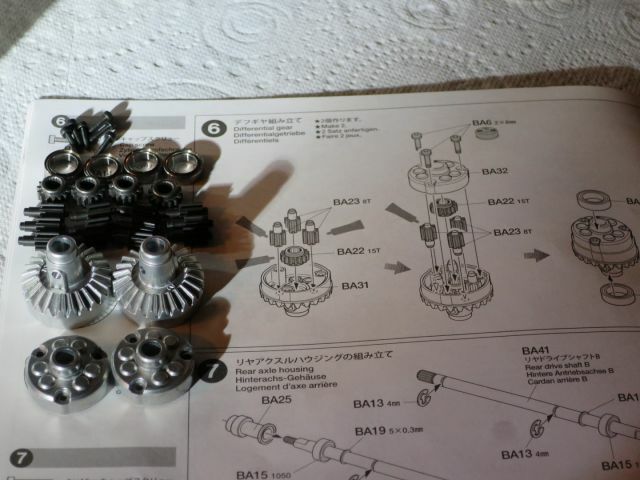 So here we are, step 23 complete, gearbox done. Bag C isn't finished just yet though, just the motor and pinion to add, prop shafts, then attach it all to the chassis, but it's a convenient stop point for now. I see the next step calls for cement for the circlip on the propshafts. It doesn't state which cement, so that's another irritating cement reference, wish they would sort this out, it's frustrating when everything else is sooo good! Great few hours, you wouldn't believe looking at the completed gearbox just how much work and componentry goes into it, and the sheer weight of it!! 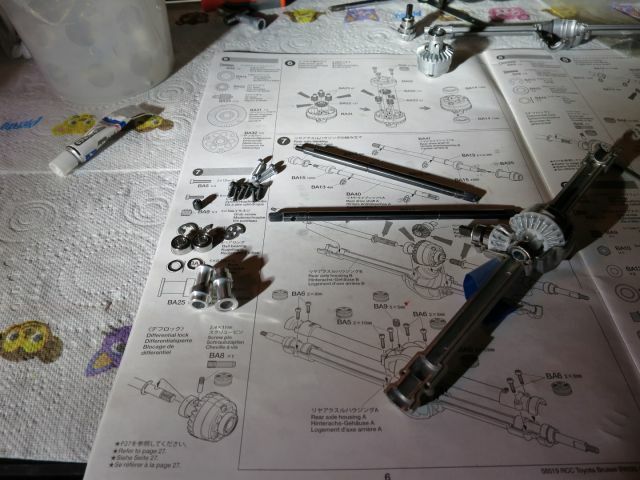 Hopefully the picture captures this to an extent, but it really is a rewarding part of the build. I never imagined it would be quite this involved. 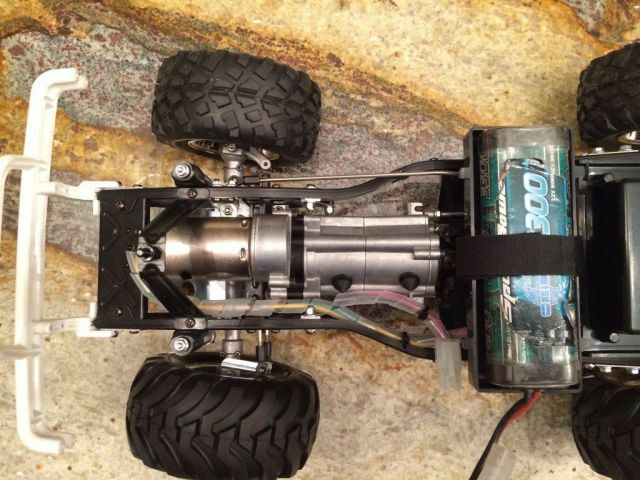 It's making me think I won't bother going brushless, the thought of ever needing to go into the gearbox again, not because its difficult or time consuming, but because the Titanic-esque components look so well engineered, bombproof and timeless, to have to go back in would almost be to do this work of art a disservice!! You just struggle to find true engineering like this nowadays, so to do so is a real treat...in case you hadn't guessed...I'm loving it!! 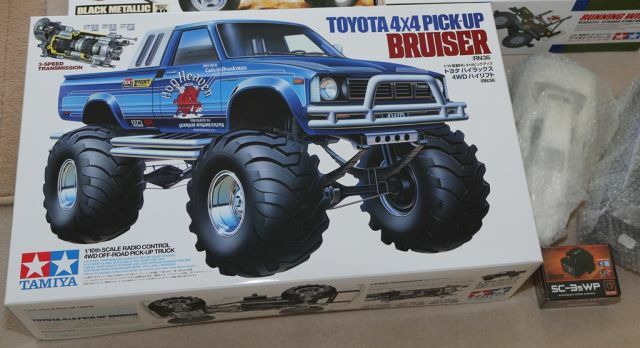 It's funny because I don't think anyone really buys a Bruiser to knock it up, it's the pinnacle of Tamiya engineering and always has been, top of the tree and always revered as such. 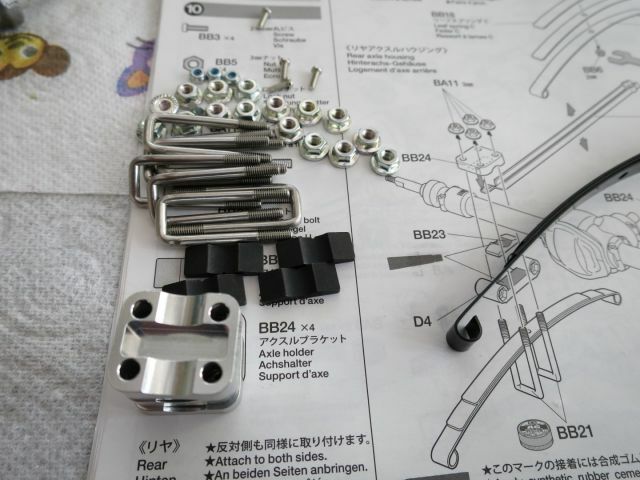 It's a really big step to take due to the purchase cost but looks like most really take pride and care in the build, so you want everything to be as perfect as possible. It'll never be quite the same again building up the stock kits after this lol. 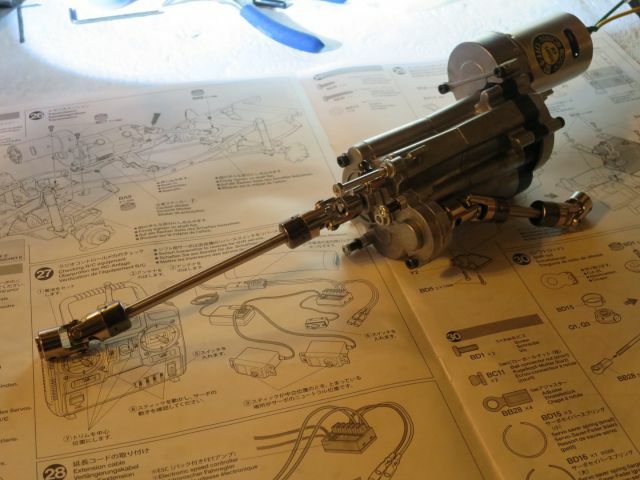 I have a Wild Willy 2 to build next, that'll be a 5 minute breeze after this, somehow I don't think it'll be in the same league of satisfaction!! 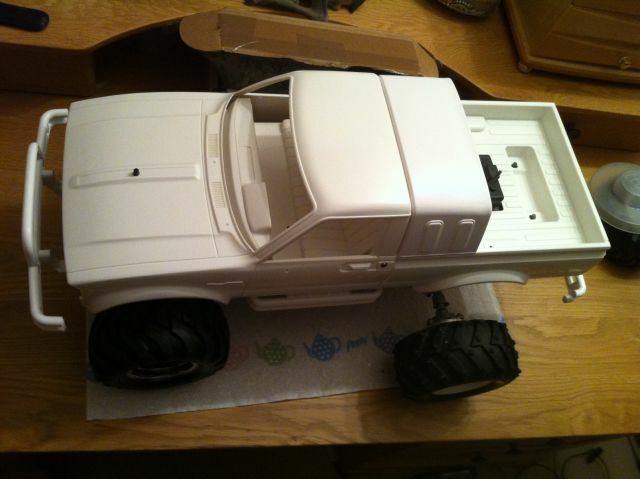 I have the bruiser kit sitting on the shelf, It will be built very soon. Finishing off Bag C. Approx 1 hour tally today. 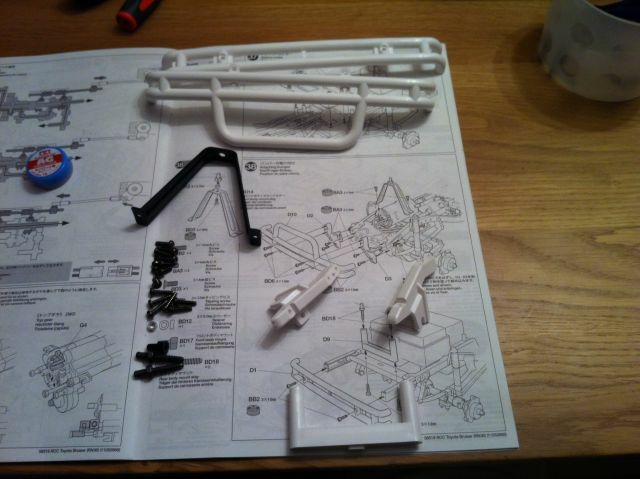 Step 25 - Adding the front and rear propshafts. now complete...this ends bag C! 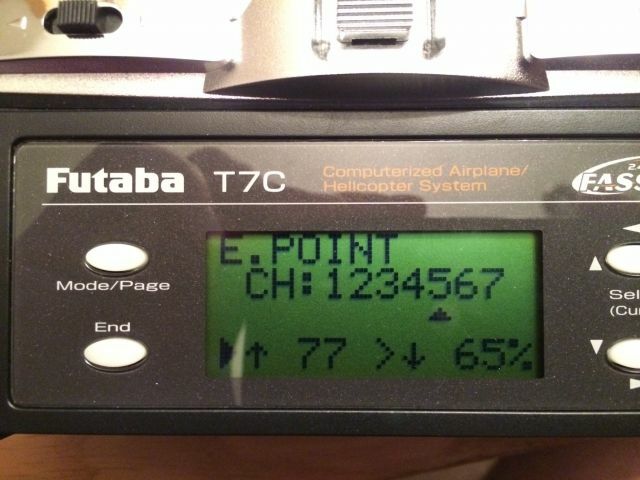 For this project I'll be using my now redundant Heli Futaba FF7 transmitter, I've robbed the receiver from the helicopter...it's 7 channels and fully programmable so should give me plenty of options. 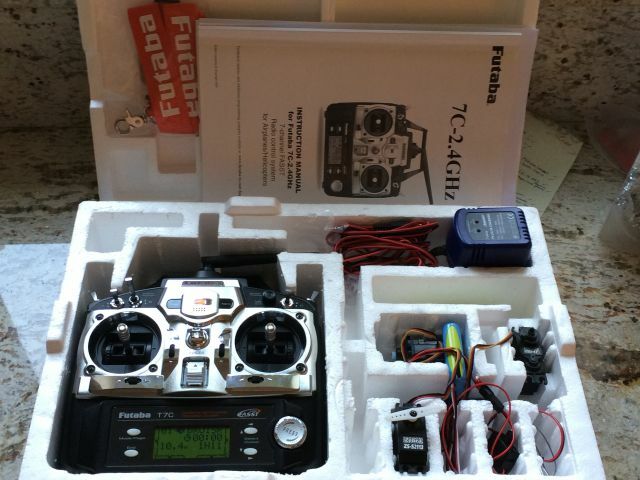 I like the idea of using Futaba on this project also as apart from being my favourite brand for radio gear, it is also period correct for the Bruiser since Futaba was the main brand available then. I'm planning to use Futaba servo's too. 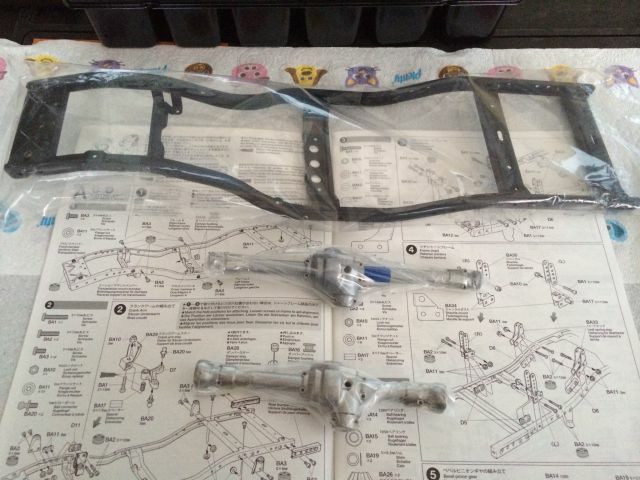 This kit requires two, one for steering, one for gear changing. I'm going to be using this 3 position switch for gearchanges...instead of H pattern change with the sticks...hopefully this will result in smoother and more precise shifts as it isn't dependent on how far you push the lever and should hopefully eradicate potential mis shifts! All already programmed in, including model name!! The Bruiser doesn't come with an ESC. 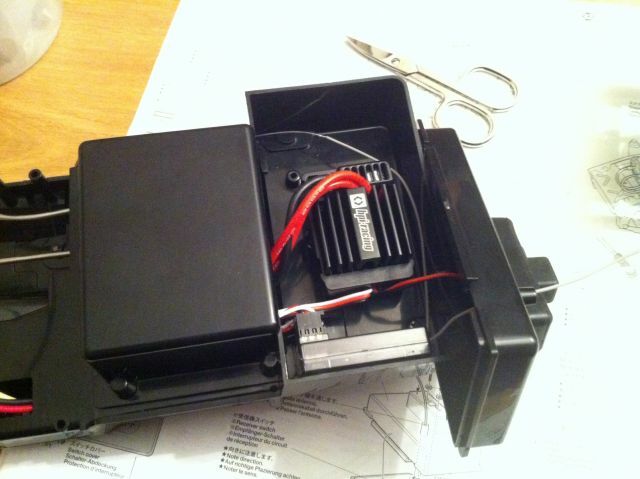 For mine I am going to be fitting an HPI esc. 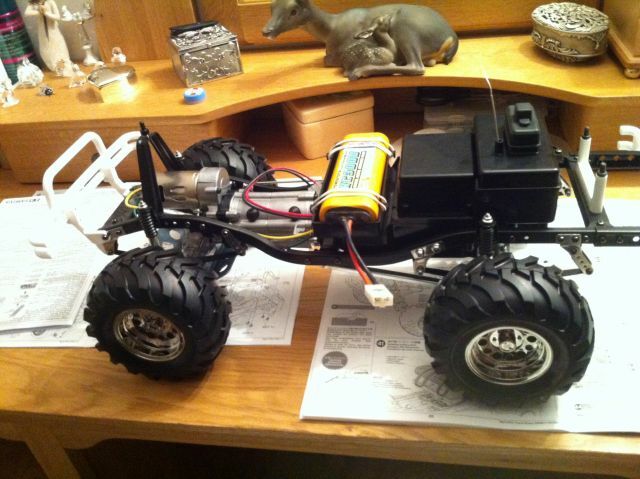 I use all HPI stuff in my uprated basher, HPI ESC, Brushless and Lipo's, I love the quality of HPI stuff, runs Tamiya a close second IMHO and actually better in many things. I've come close to buying a Flux Savage in the past as a main basher but it's almost too extreme but I like what they do, where Tamiya have been pretty timeless in the stuff they knock out, HPI is a bit more extreme and leading edge with the newer technology I think. 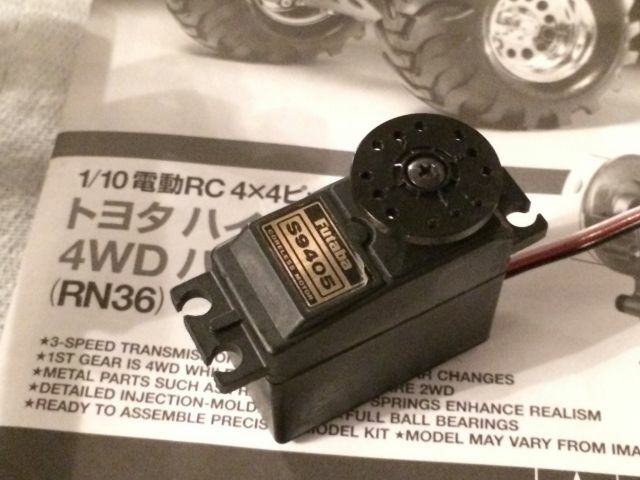 It's waterproof, Lipo compatible, (I have a Deans to Tamiya harness anyway) so I can use the round stick Lipo's I use on my basher (the HPI one doesn't fit but the Core RC Lipo does) if I want or use standard Nimh ones. 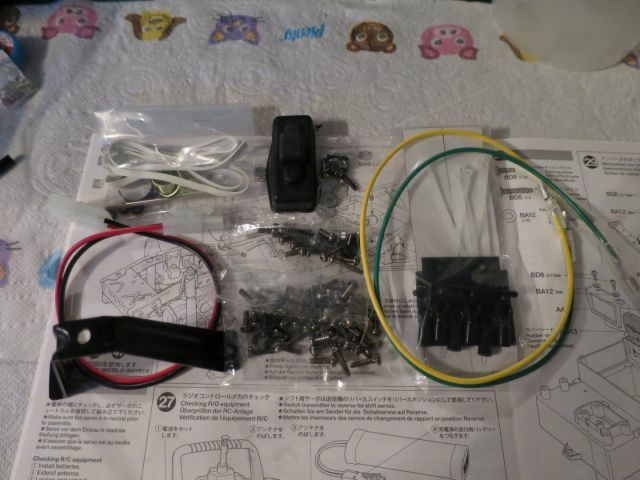 It's 2s or 3s compatible, and has standard Tamiya plug. It'll go down to a 12T so seems ideal. This was originally a stop gap to going HPI brushless (4300Kv 9T equiv), but we'll see how it goes first before making any decisions on alternative motors! I've heard top gear is pretty quick on these anyway. 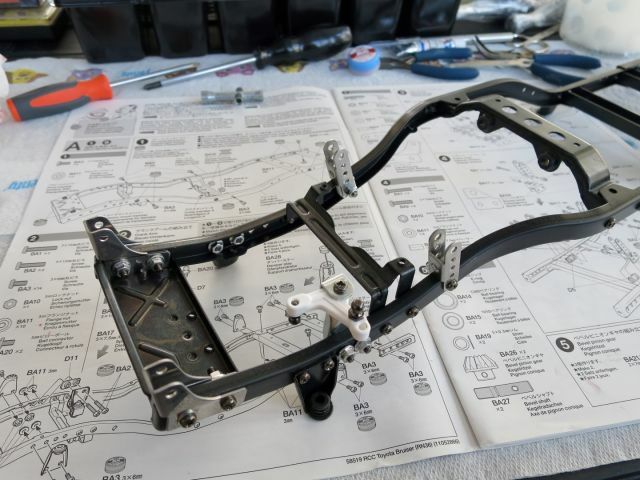 Looking at the gearbox, I don't think it would struggle with brushless power, but the handling from the agricultural leaf spring setup might become interesting; we'll see, too early to call but for now I'm fitting the above esc! 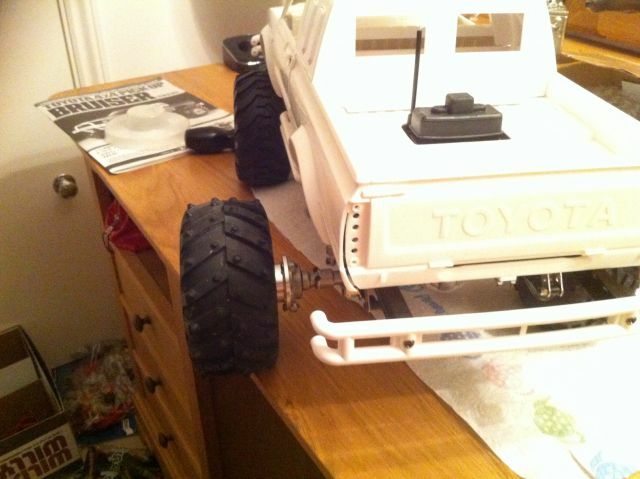 One thing I didn't consider is the switch mounting and if the switch for this esc, being much smaller than Tamiya, would mean it couldn't be mounted in the rubber booted assmebly that pokes out of the truck bed. 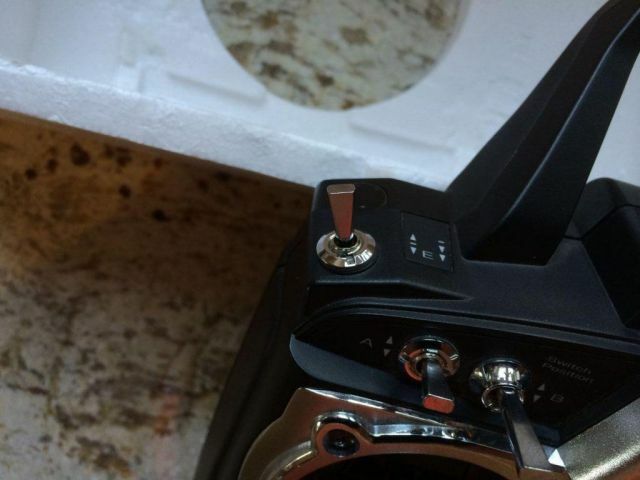 I subsequently checked out the switch on the ESC, thankfully I'm able to get it to exit and be properly secured out of the stock location and it works through the rubber boot so looks like I'm sorted switch wise. 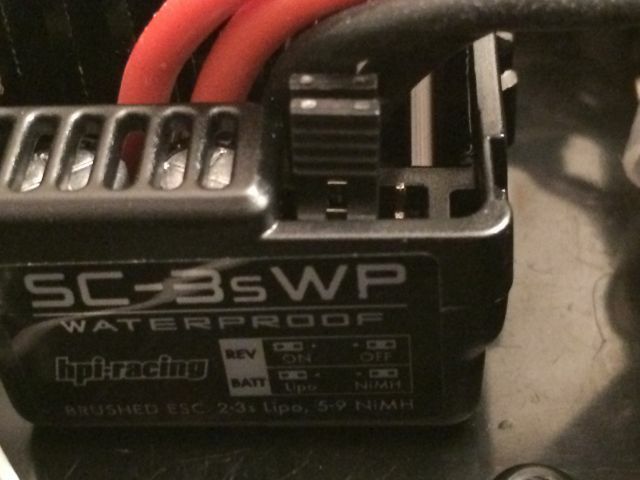 If you're using a different ESC, consider that. There was one thing that gave it away - "4Nr"
Note Step 28 above is just plugging the extension wires to the ESC. You can see the ESC on the top cover in the background with the rubber on/off boot which the switch is poking up through. 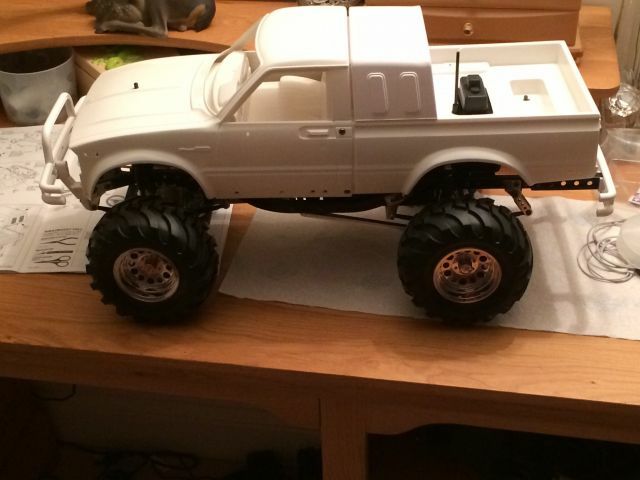 It's not as large as the tamiya switch so a little more fiddly to turn on and off but at least it can be done through the boot and easy enough when you know the technique to switching it. 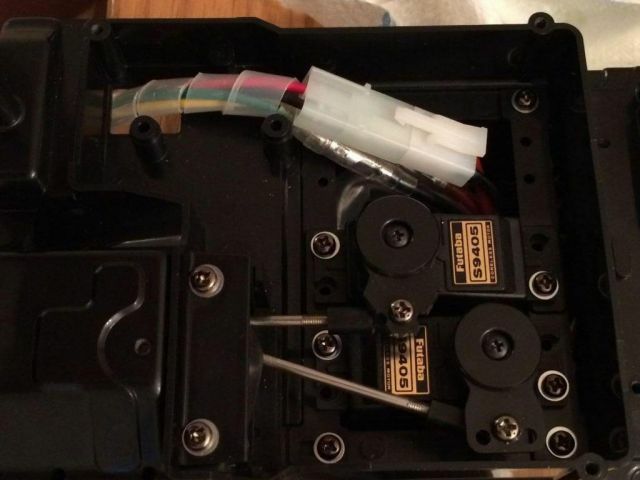 I've ordered a Futaba S9405 coreless, waterproof, dual BB, metal geared servo, which will sit alongside the regular Futaba S3003 servo for transmission shifting unless it becomes necessary to put something beefier in. I've spent 1 hour 20 minutes last night playing really, I've sort of mock built up the electronics box with another spare servo for the moment just to see it take shape. 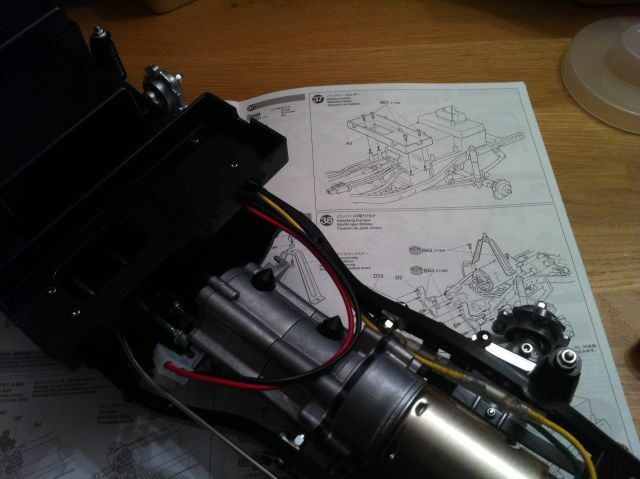 There's not a huge amount more I can do until the new servo arrives. I'll need to revisit this to add the new servo, but this is just a bit of a dress rehearsal as I'll have to go over the steps following this one again later and undo what I'm about to do! 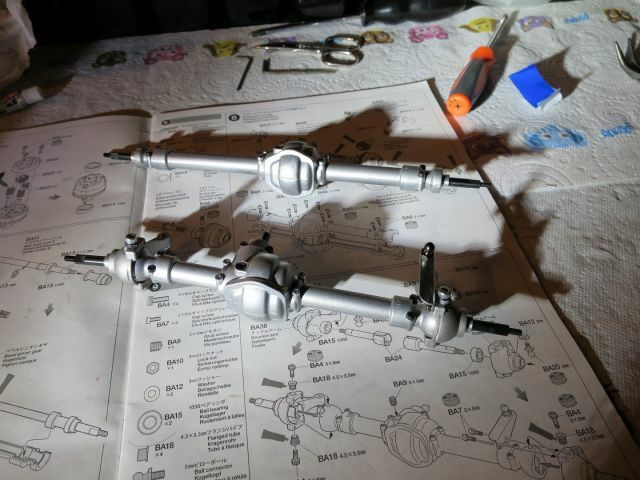 Step 30 Prepping the servo horns and control rods. 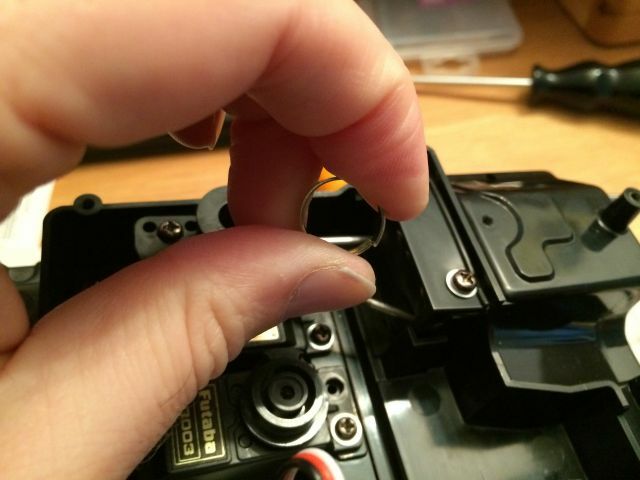 It's nice to see proper servo savers here with metal rings on them. The box isn't properly bolted down, just loosely assembled so I don't loose any screws. 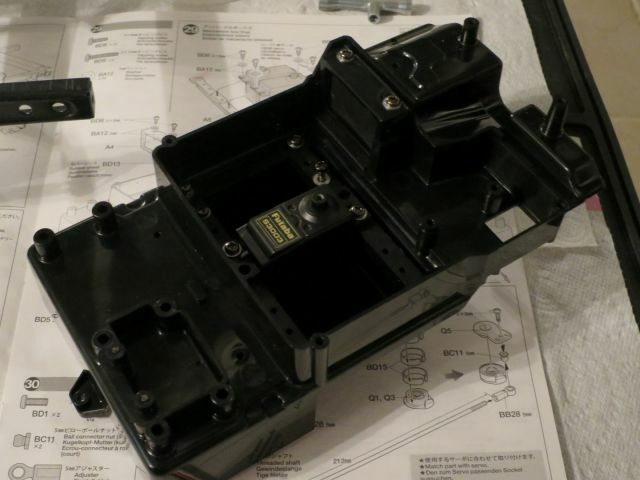 All the electronics, (receiver and ESC) are in the receiver box under the black rubber switch boot. I've had it all connected up to the radio and running slowly from it's own steam just to check servo connections etc but haven't connected the servo rods up yet. 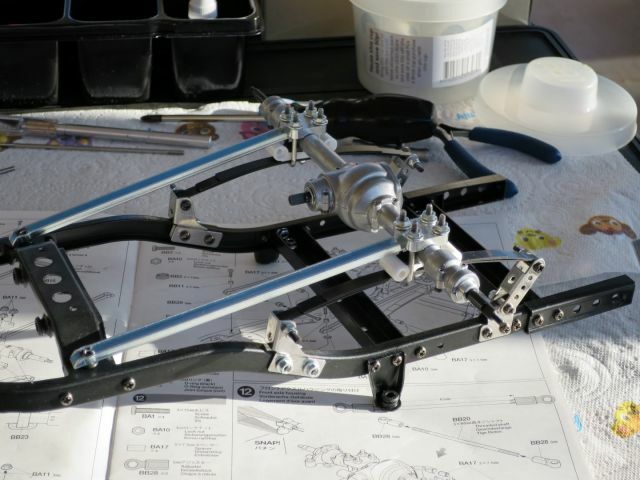 I reckon I've probably another 1h30 mins to finish the chassis now. 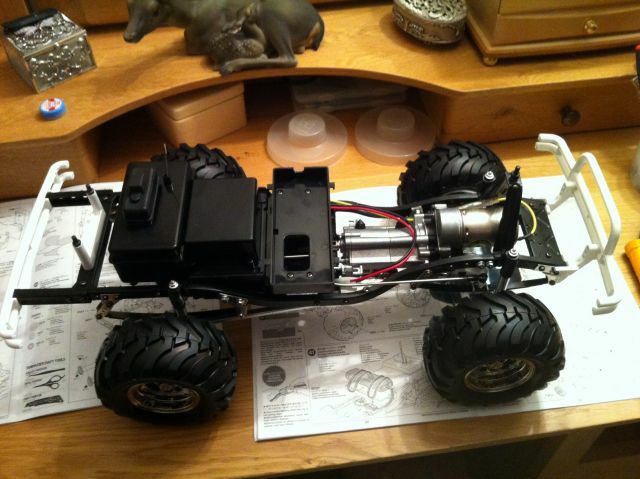 Not much left, just really need to fit the new servo, connect the rods and check the measurement on the steering rod (as the ruler in the house wan't long enough to set that one up 212mm required but it's within 1mm at the mo), adjust all the trims and settings on the remote to set up the 3 speed and make sure all working smoothly, fit the battery box and rubber bands, tidy up receiver/esc wiring and fix them down, fit wheels and tyres and body supports and bumpers. 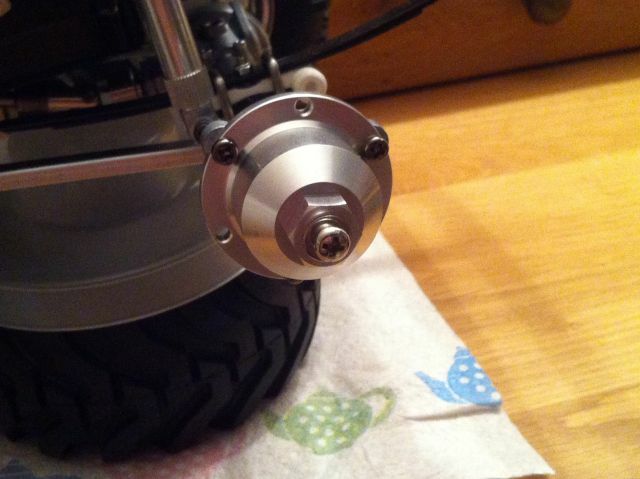 Just a small point, In the pic there are two different brand servos fitted. 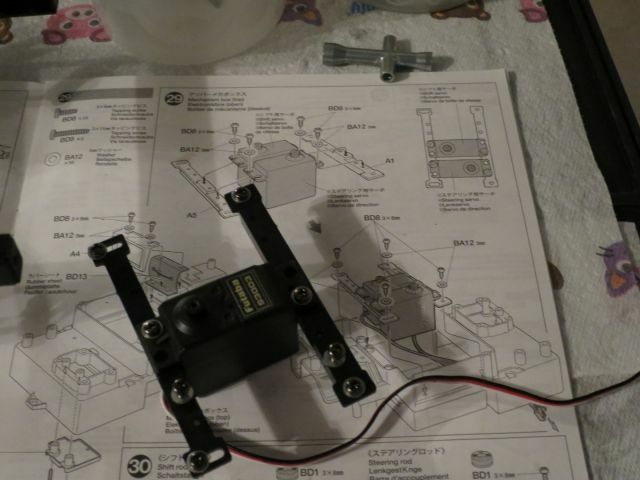 The layout of the servo supports means it's on a skew as the servos are slightly different size casings. It would make sense to fit matching size case servos. 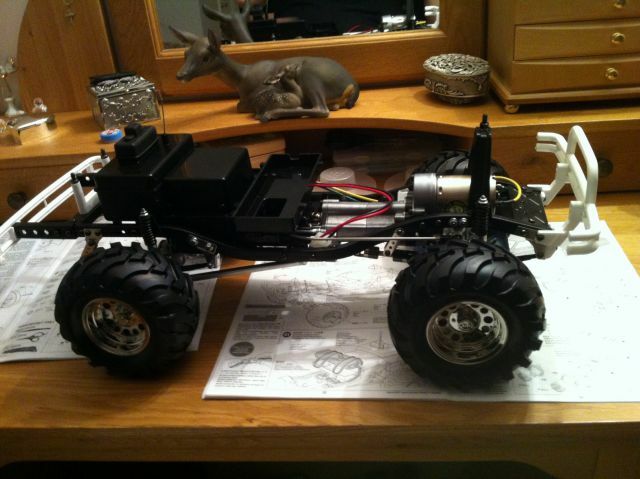 Resisted fitting the wheels, I haven't earnt that until all the electronics are in! 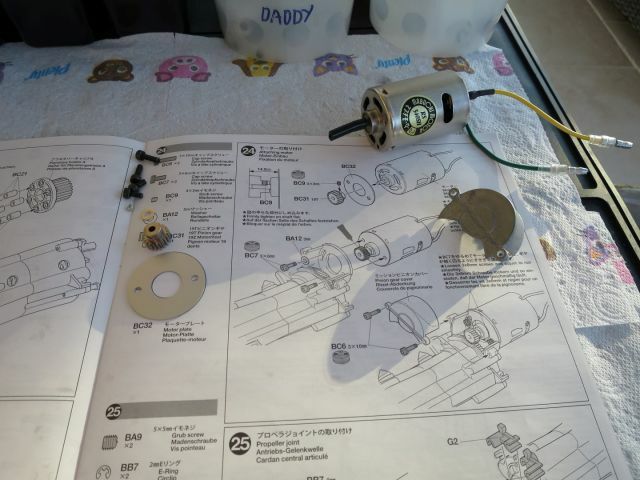 I had a bed in session with the gearbox using a 1.5v AA battery! All working well, it's fun playing with the gear shifting lol! 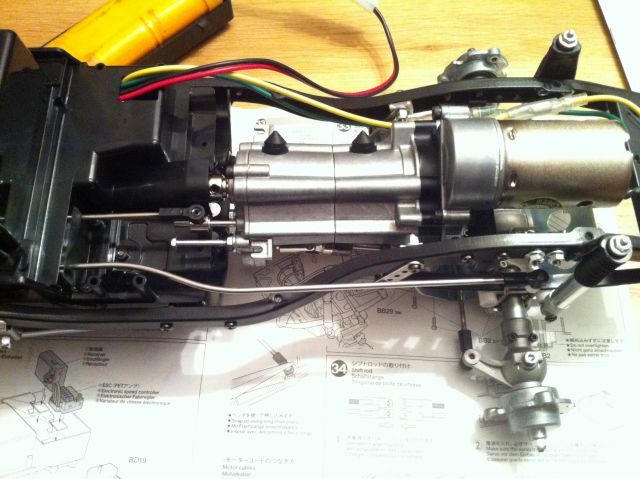 Back to step 30 to reset the steering arm length correctly and fitted the servo and all horns fitted as per instructions. 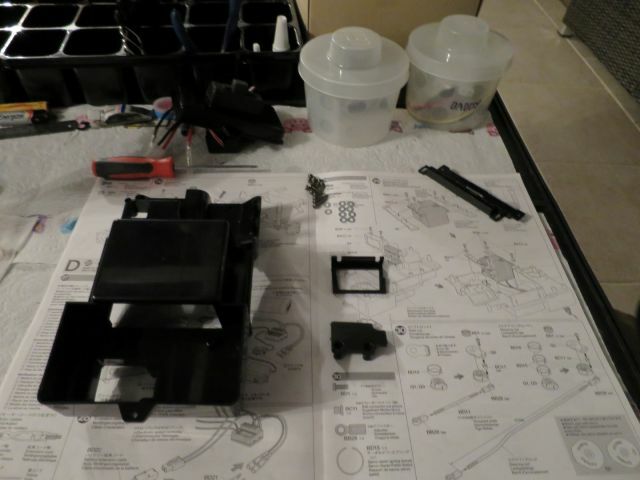 Step 32, installing receiver and ESC. 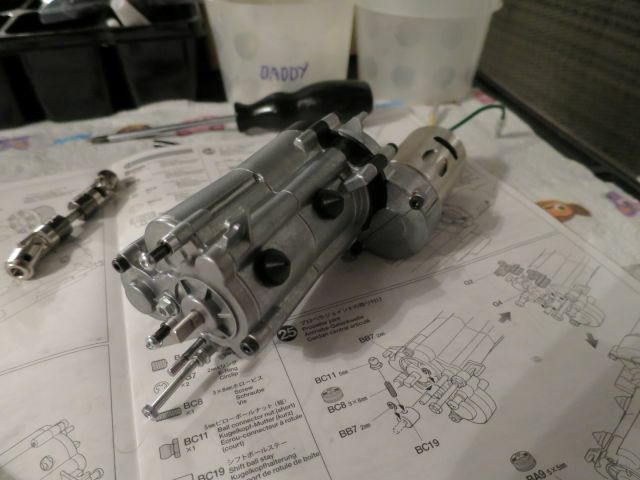 Step 34, connecting up the steering and gearshift rods. 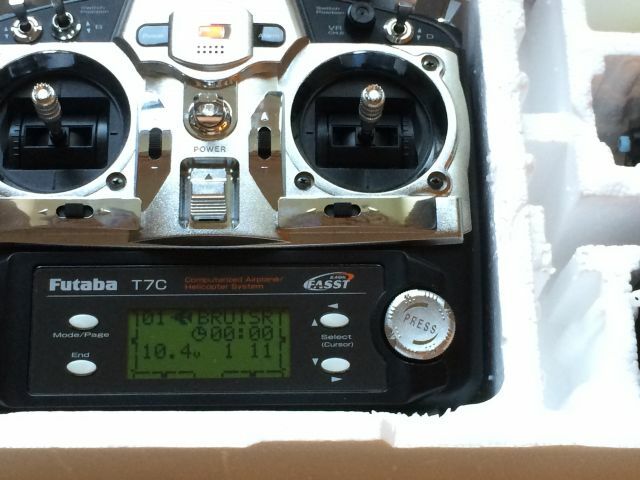 The new Futaba steering servo seems spot on, quick response, precise and smooth. 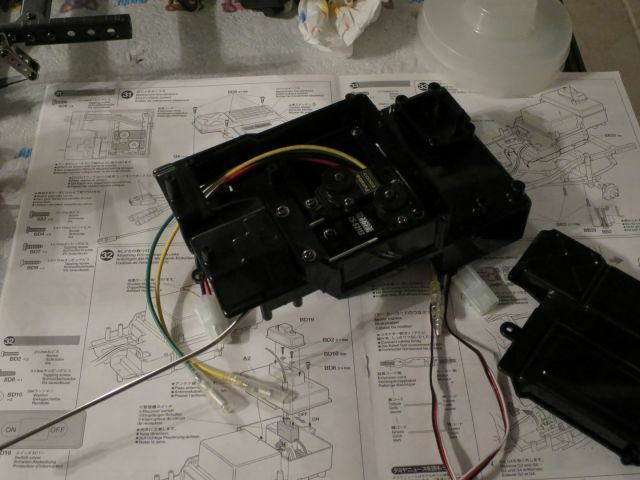 There are a couple of plastic inserts that temporarily fix the transmission rod in place to ensure the servo horn and rod measure is correct in the neutral position of the servo. 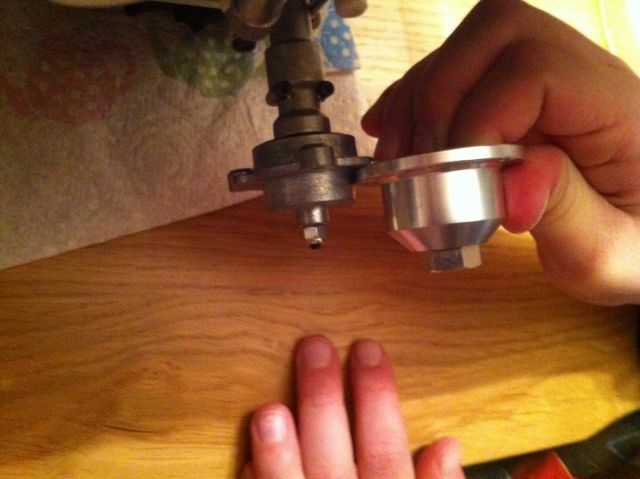 Step 35,36 was to mess about for a while setting up the end points on the shift servo so that it wasn't binding at all on either extremity of the shift. Ended up having to reduce the epa's substantially to stop the servos buzzing. 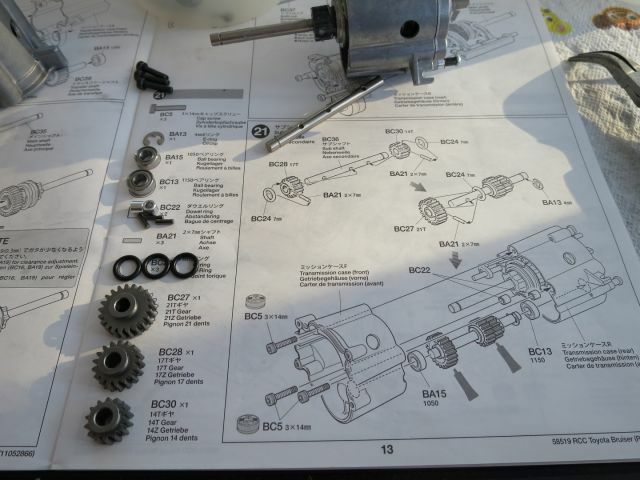 I spent quite a lot of time running through the gears and watching the 2wd/4wd shifting. It's a marvel to watch. 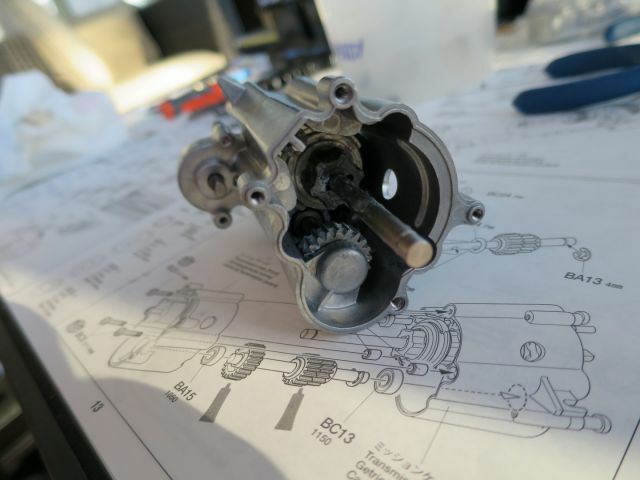 It's also interesting to note how much give there is in the servo saver which acts as a damper to help soften the gearchange so it shifts when it's ready to as opposed to being forced into the next gear by a strong servo. 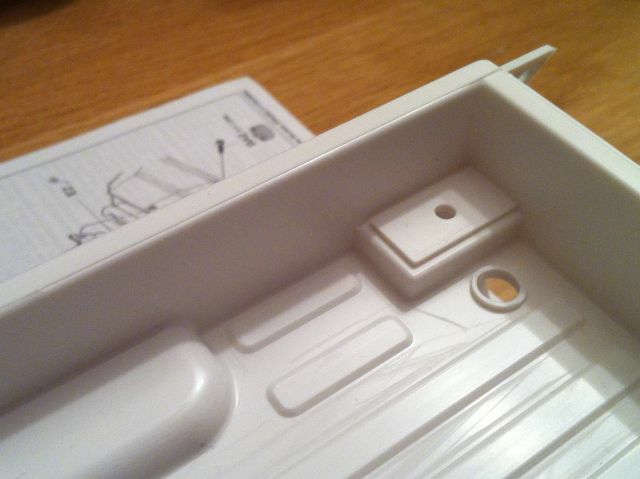 Step 41 is the elastic bands for the battery. I have a velcro battery strap left over from my heli batteries that I'll probably use here instead, then I need to get some wrap for the battery/motor wires and cable tie them out of the way and fit the stubby support tube for the aerial. Although I have been so excited to get to this point, I'm also a little sad that its over. 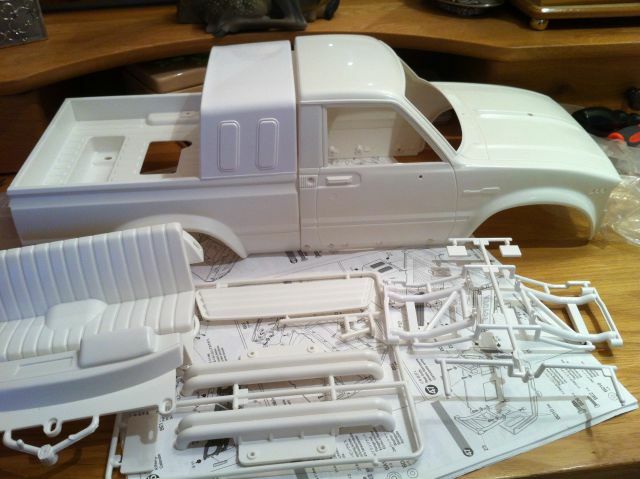 That said, its actually far from over as the bodyshell is going to be a whole new challenge. It would be easy and tempting to get some rattle cans and do an 80% good job or maybe better. But, I've bought an airbrush to try and improve on that. 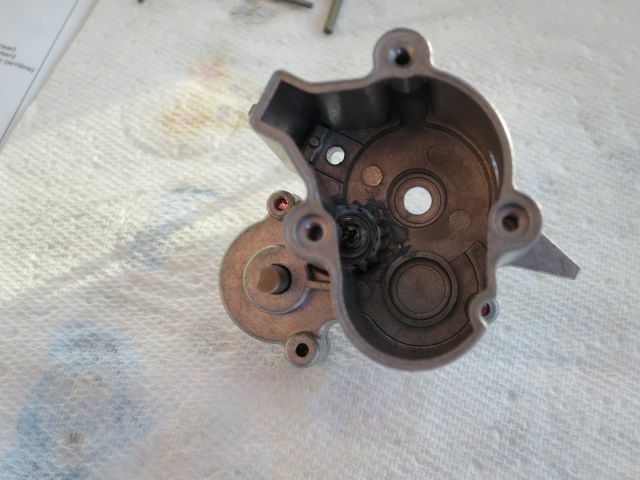 I don't know if I will be able to, I've always had decent results using a rattle can, I may even make it worse as this is all new to me, but its another learning curve so I'll post the results as I go along and keep adding to this thread! 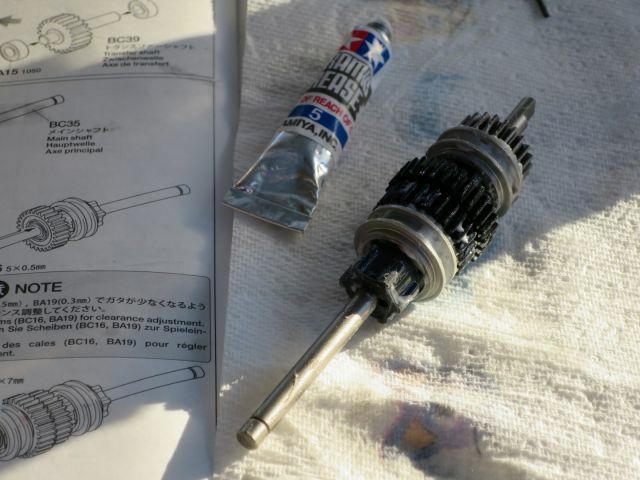 You tube video of transmission shifting. 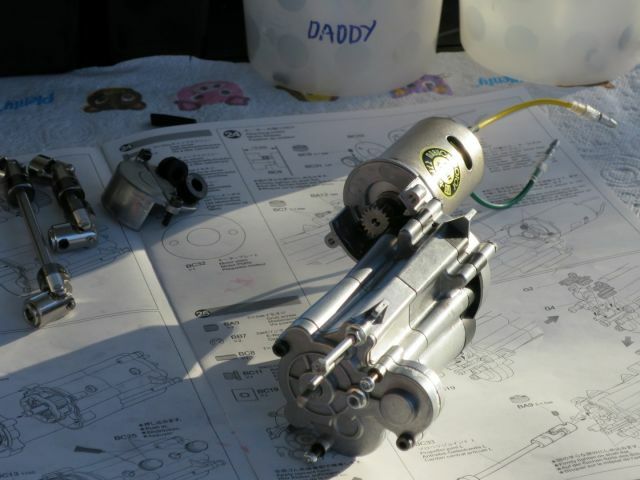 I subsequently had some small issues with the gearshift being a bit sloppy around neutral. 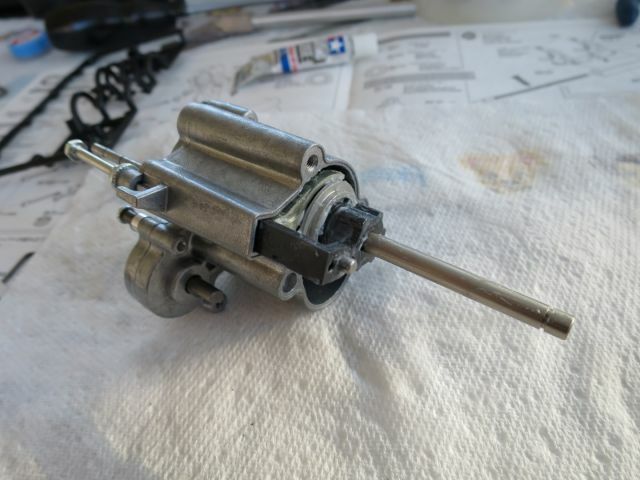 I was messing about driving around the kitchen and ran into some gearbox trouble. Around the neutral area of the servo, I seem to be getting a false neutral in the box. Pulled the inspection plugs and all seems well internally. 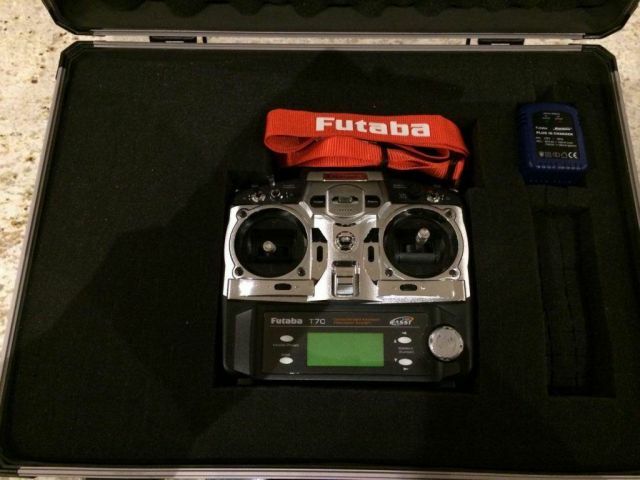 I've a feeling the issue is with the Futaba S3003 light duty servo I was using and 'deadband' issues. It seems a bit sloppy in the centre position. It may be an issue with the servo horn come loose but I doubt it. I'm going to replace this with the same servo I have for the steering, a proper heavy duty metal geared ball bearing jobbie. 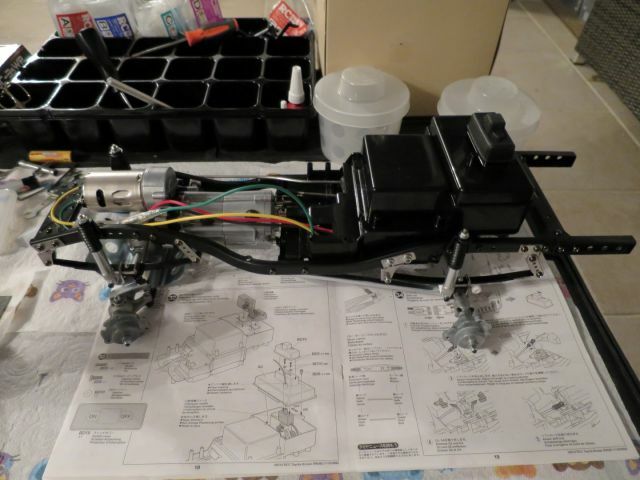 I think I underestimated the strain on the servo for the gearshifter. It actually takes a fair amount of effort to shift. 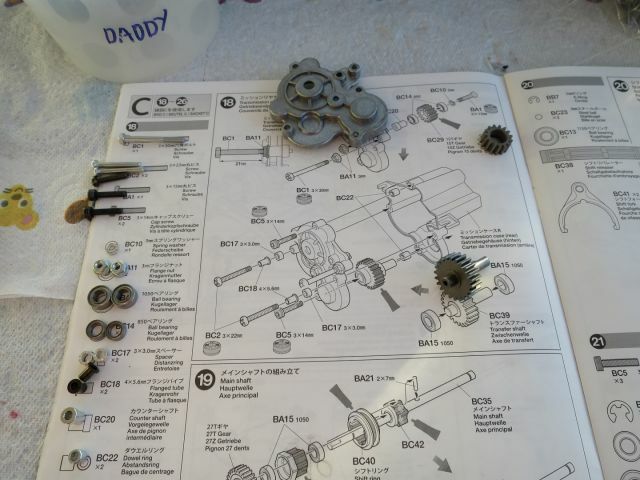 I also wonder if there is any shock loading on the plastic gear when the give in the servo horn suddenly yields to the shifter engaging as it clicks into the gear. A little frustrating to be having to pull bits apart again, but hopefully I can sort it out and it's not a characterisitc of the box! 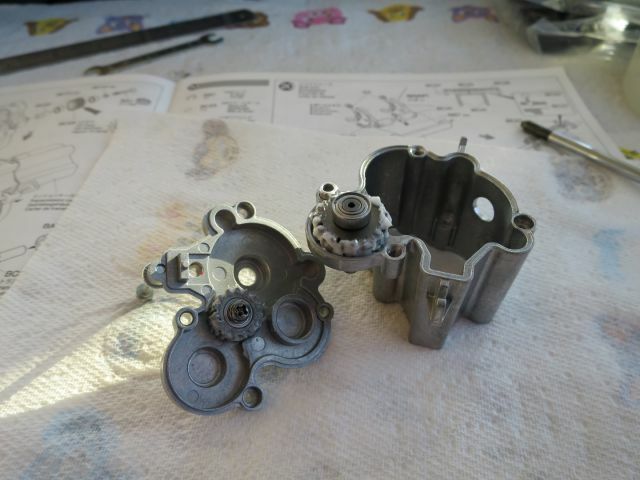 It was shifting smoothly at the beginning and the gearbox seems all ok. I'll report back when I get around to replacing it. It shifts from low 4 to high 2 (that's either extreme) no problem, it's shifting back from 4H to 2L that it goes into neutral as the servo gets sloppy or imprecise around the servo neutral position. With regards to the gearbox, I'm not really sure what the purpose of the 2L is. It does doughnuts better on the kitchen floor in high 2wd rather than low. If I only had a 2 position switch I think I'd run it as 4L and 2H. It seems to eat the NiMh batteries too. 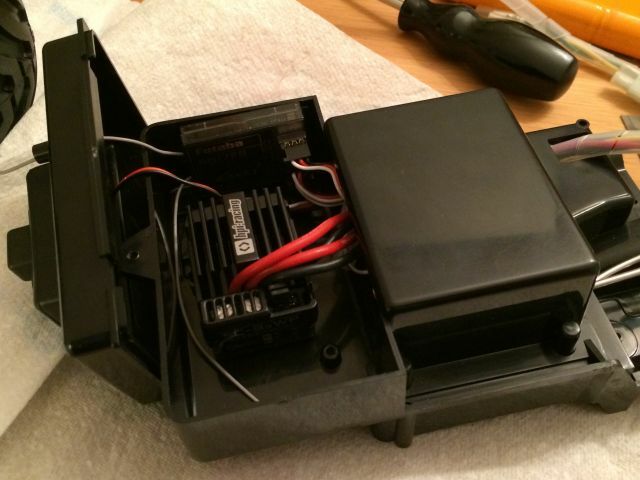 I may switch my esc over to Lipo and just use them on this. 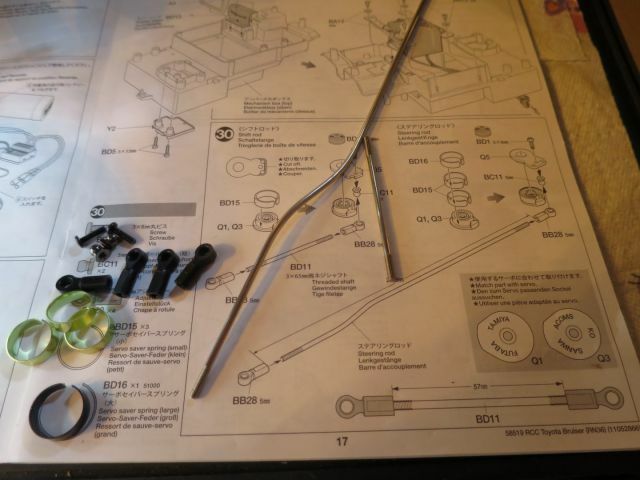 I have a little deans to tamiya connector anyway. After taking the electrics box apart to fit the new servo, it looked to me like the servo saver might have been contributing to the issue. I fitted the new matching servo while here even though I'm not sure if it was a deadband or saver issue, as I don't really want to take the electrics box apart again as it's a bit of a pain to remove. 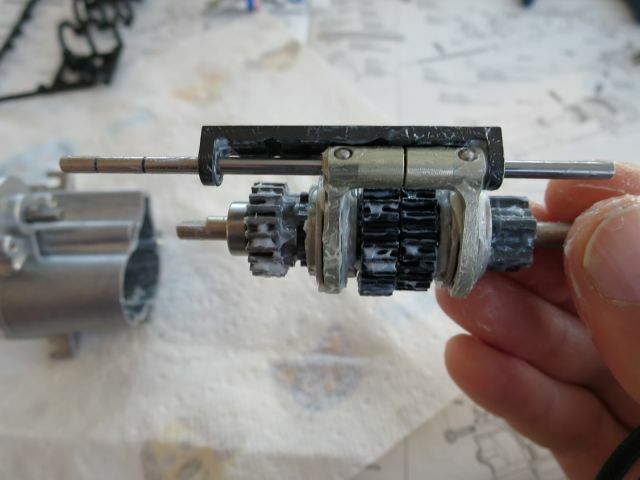 If the gearchange reverts to being sloppy again, I'll add a second metal band to the servo saver to stiffen it up a little (like the steering servo horn which actually has 3 metal bands! ), should be ok with the metal geared servo if I do need to do this I would have thought. 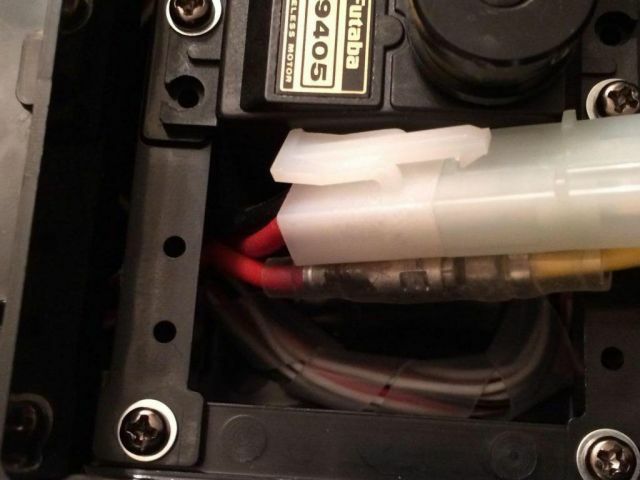 I switched the ESC's over to lipo but my HPI Lipo is 2mm too big to fit in the battery box so it's now back on NiMh. 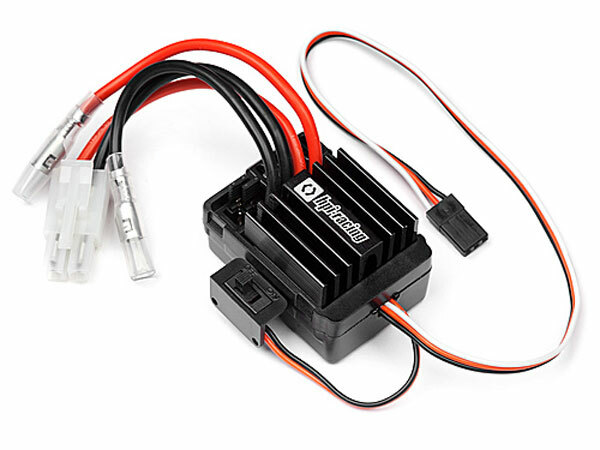 The HPI ESC uses simple jumpers to select the mode. I've spent a good hour or more driving it around the kitchen and shifting (I'm trying to drain/cycle some NiMh batteries that are playing up) and it has been shifting seamlessly. I hope this continues, if I get the mis-shifting into 2L like I did last time then it will definitely be the tension in the servo saver being too weak. I did take a video of the play/lack of tension in the servo saver for reference, I probably won't be uploading it unless anyone specifically wants it. This has the pre cut strips so you can shape it to whatever you want. 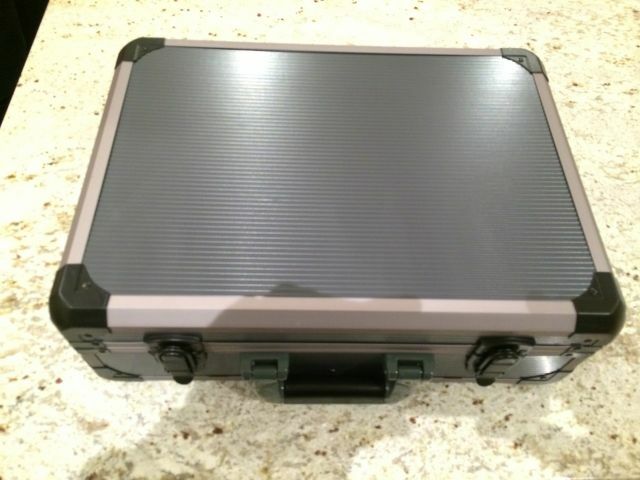 The quality of the outer case isn't that great, mainly because one side has about 3 rivets on the outside face of the case, otherwise fit and protection is great. Was around £37. Next instalment will be body shell...which is another epic saga...or at least I seem to be turning it into one! From the outset of this build I've been obsessed with raising the bar and trying to take my build skills up a notch to a higher level. 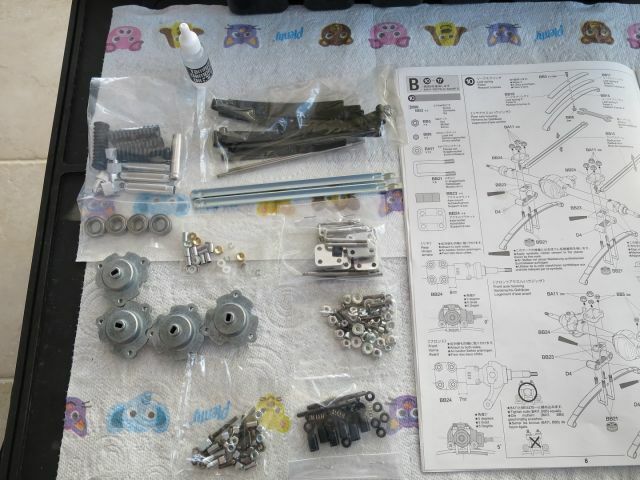 There is something about the Bruiser, probably a reflection of the quality of the components and attention to detail of the kit you're working with and the anticipation of building arguably Tamiya's finest masterpiece that really makes you want to raise your game. 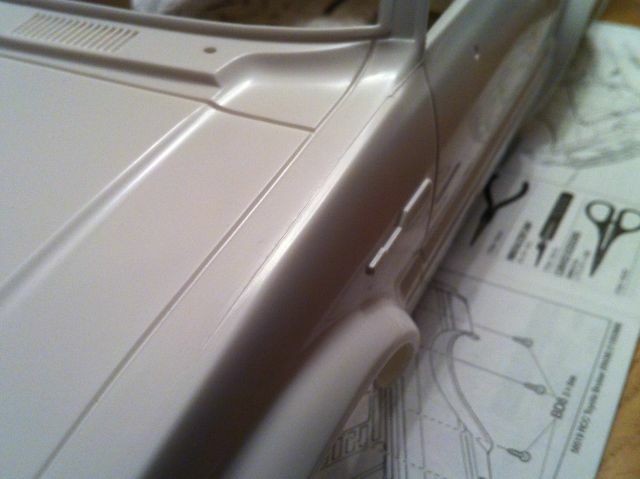 First glimpse of the bodyshell. offered onto the chassis but the two halves aren't screwed together yet. I've been cleaning up some of the mould flashings. I've part sanded down some of the flash lines. I was a little worried about the christmas tree bits attached to the bodyshell at the windscreen and on/off switch on the rear bed but it's come out great. used side cutters, then modelling knife then some 800 grit paper. 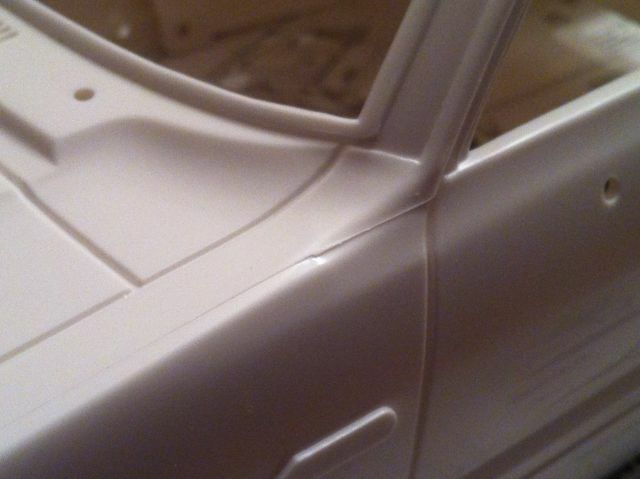 Used the 800 grit on the flash lines on the bonnet edges, I've left some raised deliberately to take pictures. 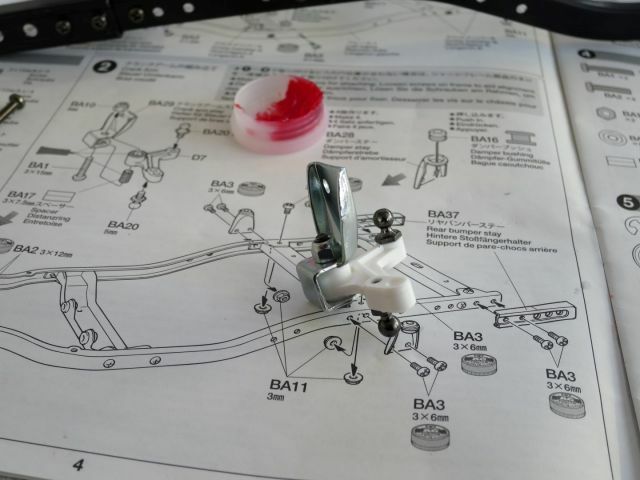 I can't find the "synthetic rubber glue" that the build called for in a couple of areas. Maybe tyre glue would be similar? Interesting that no dealer seems to stock all of the above. In fact 2 items is the most I can get together in the UK, everything else I need to go to ebay for. 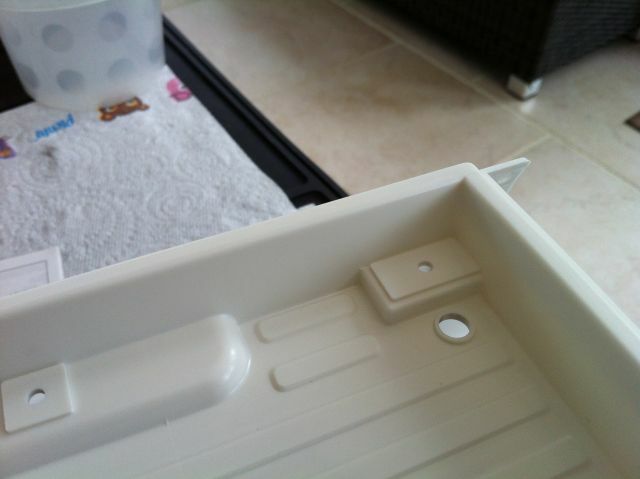 I will also order the little paint pots for the detailed touch up areas. 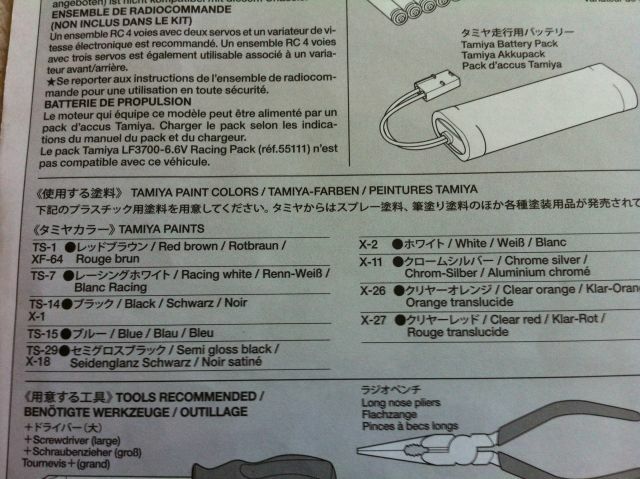 Paint codes are shown in pic below. So onto the bodyshell proper now. Here's the type of mould flashing I referred to earlier, there's a lot of it on this shell, also on the practice mad bull shells I have too actually. There are a lot more examples elsewhere. There's a bit of a dichotomy here, who is ever really going to get up close enough to notice these things. Just a quick primer and rattle spray can and really it'll still look great. You'll only really notice this stuff up close but seeing as I'm taking my time to try and push myself to do the best job I can at my current level of experience it needs doing. I really am petrified of messing it all up with airbrush and particularly lacquer but I'll cross that bridge when I get there. There's a familiarity with the rattle cans that is still calling out to me! Anyway enough moaning about that, I'm going for it and "que sera, sera!!" 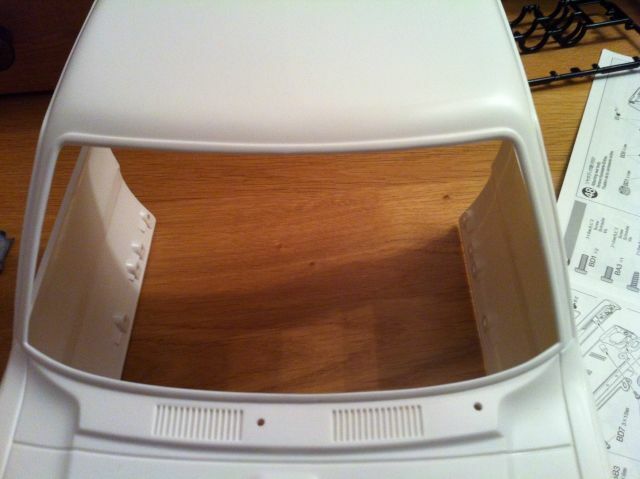 You can see towards the front grille area where I have started sanding. I've left the rest for this shot to try and show the difference. To be honest, rattle can or not, it's worth going to the effort of doing this. 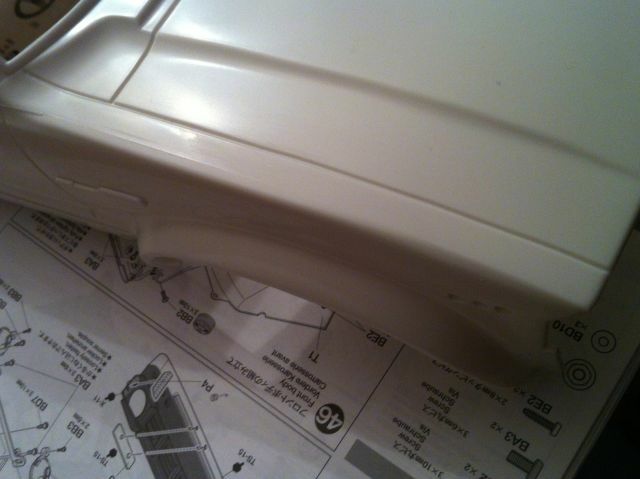 I'm pretty sure the smoother edges will help the paint adhere better anyway and give it less of an edge/line to catch! This is all around the windows, rear tailgate etc etc. While doing this, I notice that the shell isn't actually ABS, but Polystyrene, I thought it was quite soft. This also explains why the side bars are always a different colour to the bumpers and sleeper cab. I always wondered about this when I saw it in pics. It's not a great pic for lighting but you can see the different white on the sleeper cab. 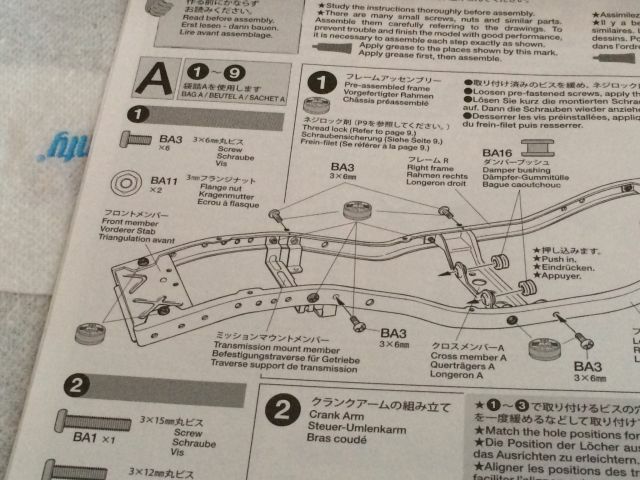 The front and rear bumpers are also abs. The side ones are PS like the body! So a fair bit of gentle work here. I'm using 800 grit paper, sometimes wet. To be honest, it's quite therapeutic, I'm a bit disappointed in myself for not prepping my sons Mad Bull shell this well the first time. Although to be fair, that was my first attempt and I did key it all up etc, first go with primer, rattle can and all that. That shell still took me ages doing it over a few days each night when I got in from work!! 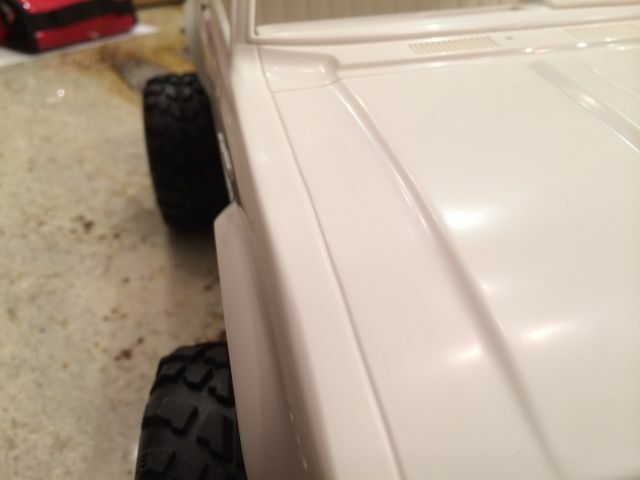 I noticed a few more items when looking really closely in the light; Nice dent on the rear tailgate, I was quite tempted to leave it as a character dent, especially as my 1:1 Hilux has one in exactly the same place!! Then I started sanding it out lol. The flash lines have all been cleaned up and I had quite a few messy details around the rear light/tailgate area, the A-pillars, around window frames, on the underside of the arches, and top rear of cab among other areas. Here's the front now cleaned up. Up by the A pillar are a couple of angles going off in different directions which is a little tricky, I think I've got it right now because it tapers up to the A-pillar as well as following the sculpted line on the wing and door so it's a case of sympathetically blending it in to both. 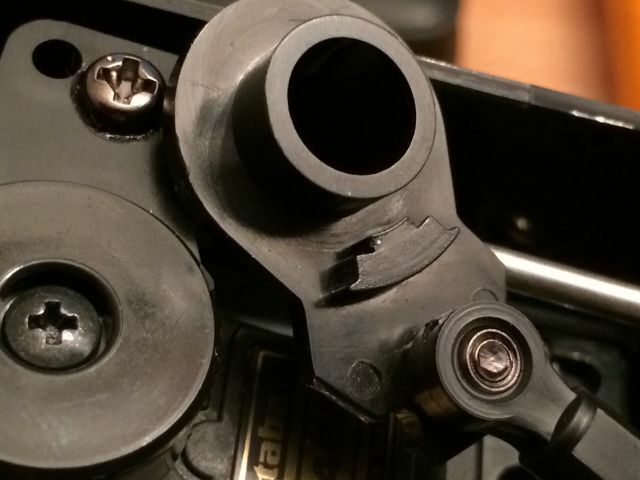 Struggling to see what went wrong with that servo saver - is there just a single spring ring on there instead of all 3? 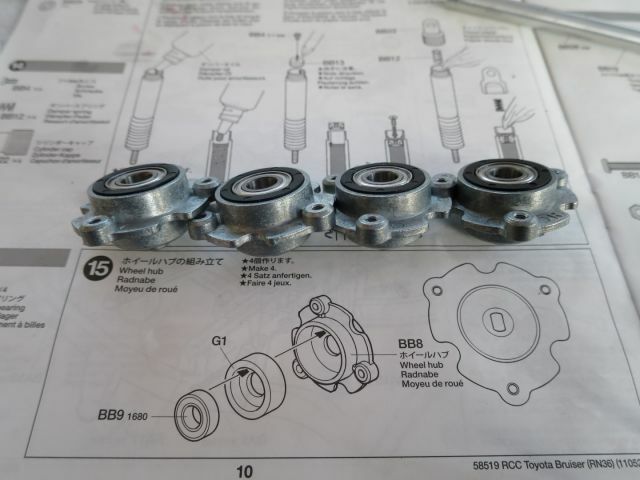 The manual only calls for a single ring on the transmission servo. The steering one has three. 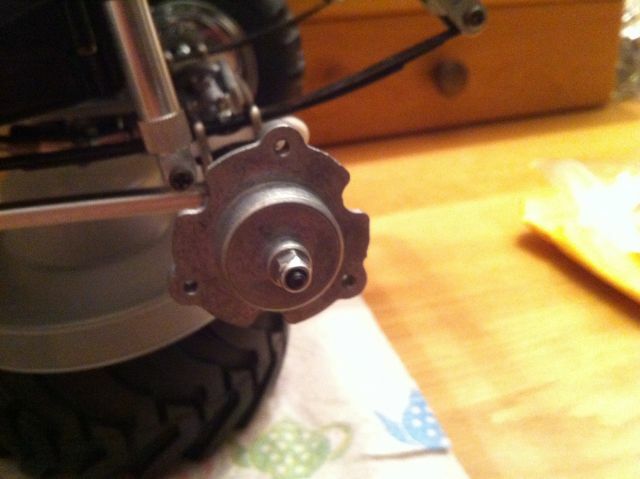 I was getting an issue when shifting into the middle gear, which has the servo in its neutral position. What was happening was occasionally it was not engaging the gear correctly due to wooliness in the centre position of the servo. After reading up I understand that analog servos can suffer with deadband which is a lack of torque and response around neutral and small inputs. I think the entry level servo I was using didn't have the precision. Uprating to a quality coreless servo has cured this, either that or increasing the tension on the band or a combo of both. The servo saver give I believe is there intentionally so the servo loads up the gear selector but it can't engage until the box is ready so as not to force the gears. 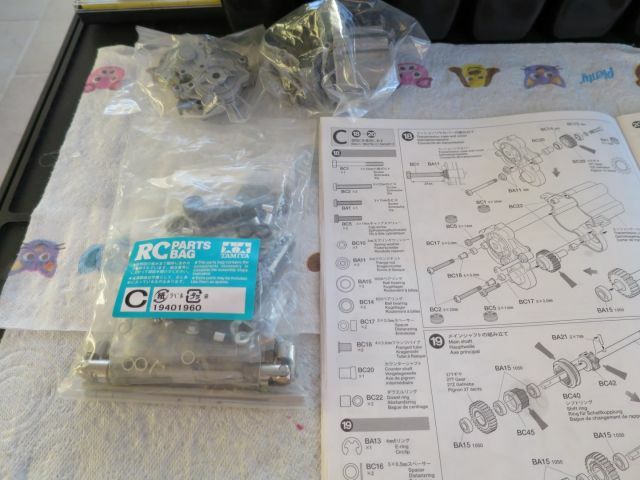 The problem I was having was that when it did engage the servo wasn't self centering to its neutral position as accurately as it should have been causing a false neutral with the box free spinning in between gears. I believe coreless motors are much better than 3 pole at accuracy around neutral, and digital even better although they have a higher power consumption. It's all good now though. 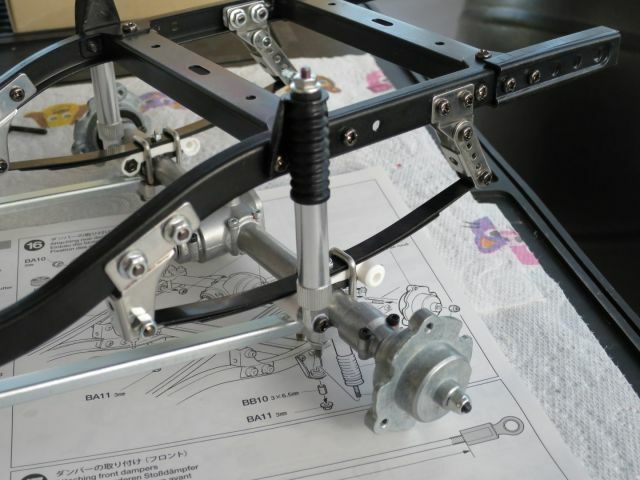 The chassis was finished on 7th January this year. I took a break before moving on to painting the shell, so I could get some practice spraying using the airbrush I finally bought after hankering for one for years. 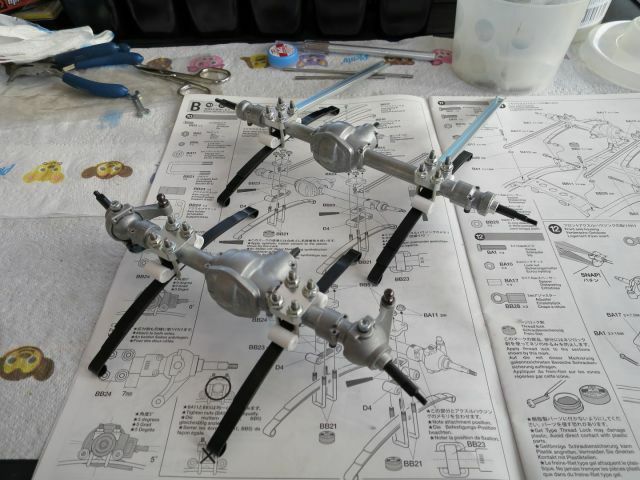 My previous airbrush experience was with a blue plastic revell one (I think) running off a compressed air can when I was about 10 years old. It's an Iwata Kustom TH. I did a lot of research and am absolutely delighted with it. 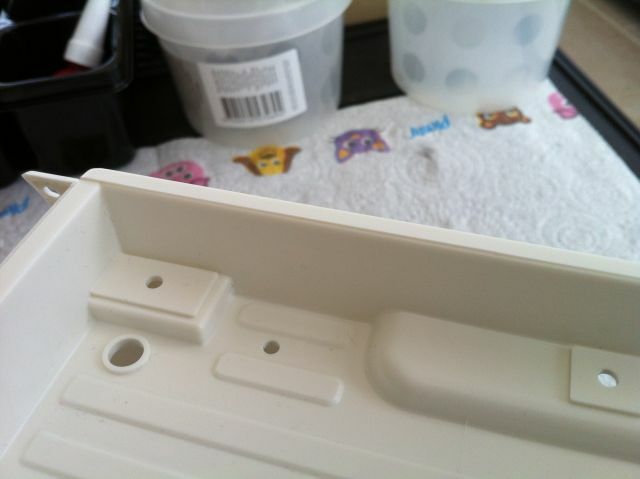 It's a 0.5mm nozzle which means it can handle lacquer and metallic paints without it clogging up the nozzle. The Kustom series has a larger paint cup, a snazzy case and a moisture filter. It also has two end caps, a fan pattern and round pattern so as an all rounder for what we do it is nigh on perfect. It's not cheap, it comes with a ten year warranty though and you'll never need to replace it! 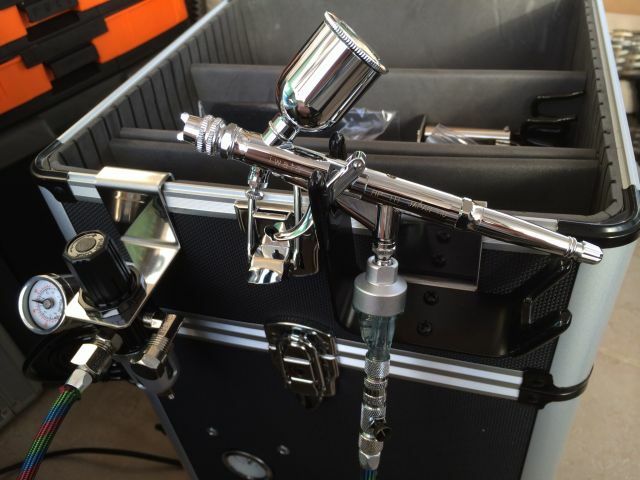 It also has a mac valve so you can regulate the air as well as the fluid delivery from the gun. 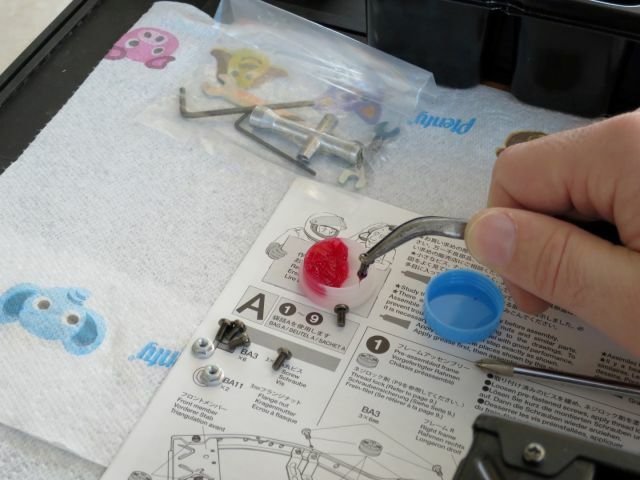 You can also set up a limit on the trigger so you don't overshoot if you're worried about laying paint down too wet. I also went with the matching Iwata compressor, which I scored in a black friday sale! This really does pretty much everything, I'm delighted with it. So in between finishing the chassis and painting the shell (a combination of waiting for better temps and ruining a mad bull shell I spent a couple of months trialling stuff on), I started looking at hop ups and doing lots of reading. Perhaps it would just be better to save your money, depending of course on what you want out of your Bruiser! Scalers look away. If you want to guarantee it doesn't end up on its roof, you could go for this wide track conversion lol. 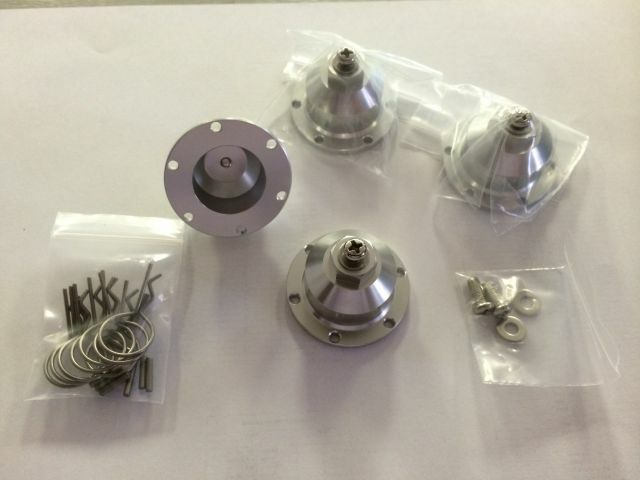 Of course, there are probably other hexes on the market with a much deeper offset than these rims which may be able to take proper advantage of these adapters. I think if you were to hit anything (catch a wheel or the like) running with these WR01 wheels, you'd probably do some serious damage to the axles!! My Son thoughtfully lending me a hand to take this shot!! 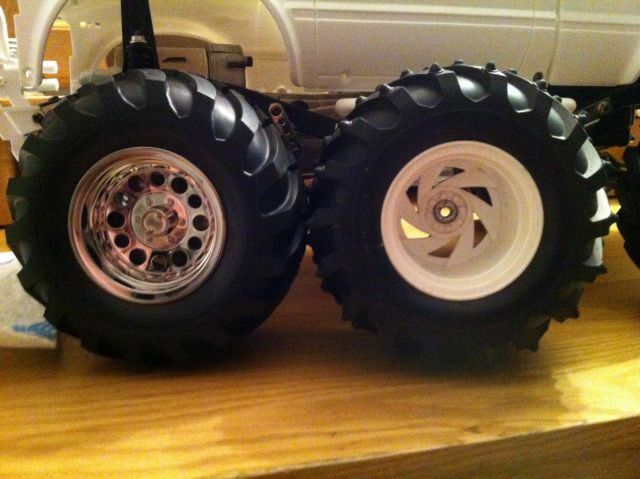 And finally just a comparison between WR01 pin spikes and the Bruiser tyres, 120mm vs 118mm respectively. So that was interesting, albeit I feel like I've perhaps wasted £20, I may be able to find some suitable hex wheels but the offset issue will certainly restrict available options. Anyway, you don't know until you try. 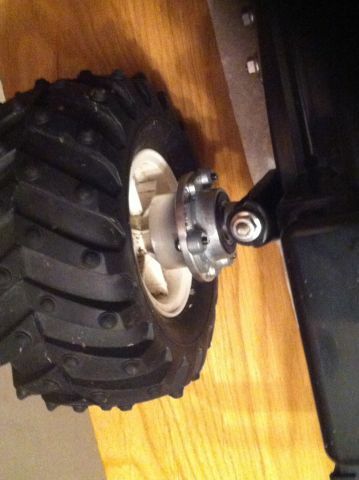 They'll make a nice spare wheel holder for one of my models lol!! The re re doesn't come with the original 3 piece beadlock rims, instead it comes with the one piece Mountaineer rims. These Option rims are as per the original Bruiser equipment. 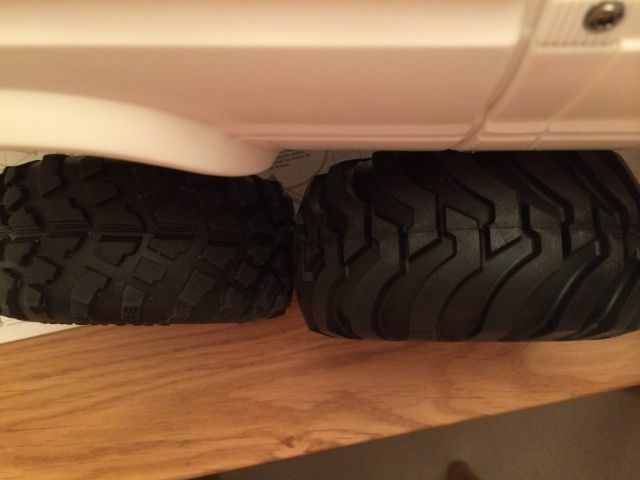 With these I've fitted the HPI tyres Yokohama Geolanders from my Lunchbox which are great tyres with sponges, they fit the wheel fine but come up smaller than the bruiser tyres by about 10mm in overall height and width (118mm high vs 108mm and 60mm vs 50mm). 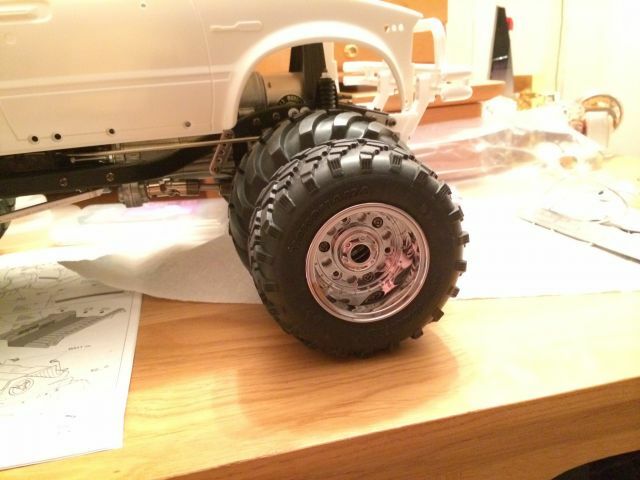 This gives less of a big foot look and a little more of a scaler look, the jury is out, think I'd like to find some tyres slightly closer to the original size. These handle great on the lunchbox. Also notice that the 3 piece rims don't have a centre hub cover. I'm well happy with the wheels, they grip the tyre really well. I would prefer it if they replicated the hub like the standard wheels as the locknut looks a little strange (perhaps I could find some aftermarket centres) but really pleased with the way they go together, so much better than gluing tyres to the rim.